Patent Application US20060073976 was filed for a Method of Gravity Distortion and Time Displacement. The filing date is listed at October 1, 2004 by Marlin B. Pohlman of Tulsa, Oklahoma. The application includes the identical images posted by John Titor online, as well as the time travel theory he discussed. ...researchers hope to check out in the Large Hadron Collider - the world's largest atom smasher located in Switzerland (CERN). "Our theory is a long shot, "but it doesn't violate any laws of physics or experimental constraints," said Tom Weiler, one of the physics professors at Vanderbilt University testing the theory. I apologize for not updating the site for almost a year now. As many of you have pointed out, November 2, 2010 of this year will mark the ten year anniversary of the first time John posted in an open forum. For the last few months, I’ve been going between utter fascination and luke warm interest on John Titor. 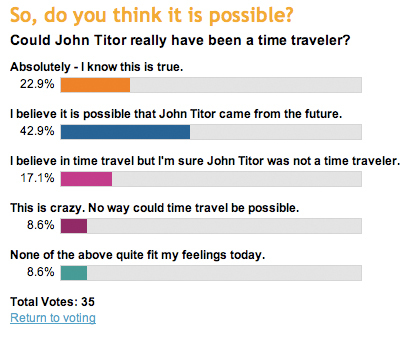 I guess I was waiting for the day either a time machine was invented or the “real” John Titor finally came forward. 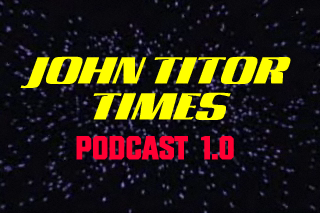 Last Sunday, I got a Google Alert that took me to an audio chat room discussing John Titor at GodlikeProductions.com. I was amazed at how many people are still following the posts and the many diverse opinions and ideas on who wrote them and why. As a result, I started digging around the thousands of email I get to see what was new. I’ve also decided to finally try and update the website. I have plans to make the site more user friendly and interactive as well as organizing the information better. So please stay tuned! Is There A Code in John’s Posts? OLIVER WILLIAMS: Starting around March of this year, I started getting more and more email about a strange website and a series of YouTube videos. The following website was put up in the spring of 2009 by what looks like to be the outfit Larry Haber runs. It’s only one page and doesn’t seem to have anything else on it but a series of dates and numbers. There’s no explanation as to what it is. 177 Tempus Edax Rerum - Good Luck, John. OLIVER WILLIAMS: On March 22 of this year, a strange YouTube video appeared. Again, apparently put up by Larry’s organization. The video appears to be a letter written by John explaining why the posts were written. It suggests that there were actually two different versions of John who wrote the posts and a code was used to communicate information between them. Many emails have pointed out that the numbers on the foundation page are between 1 and 3 which may have something to do with John’s divergence. OLIVER WILLIAMS: Early in 2009, a blogger claimed he had uncovered the identity of John Titor. He said the strongest evidence he had was linked to a mysterious PO Box in Florida. As a result, a group of guys with a local production company started tracking down the PO Box which led them to an interview with Larry Haber and Michael Hartson, the actor who played John in the (still yet to be seen) short film. There are 12 videos in all (so far) which are worth a look. Lloyd's time machine gets around this because of the probabilistic nature of quantum mechanics: anything that this time machine allows can also happen with finite probability anyway, thanks to these probabilistic laws. However, if nonlinear behaviour is allowed, time travel will be possible wherever it takes place. As Lloyd and co say: "It is possible for particles (and, in principle, people) to tunnel from the future to the past. " The NINDS says sporadic CJD accounts for at least 85 percent of the cases. Supposedly, sporadic CJD just strikes out of the blue for no particular reason. But Spanish scientists say they've found compelling and disturbing evidence that people are infected with the disease during operations. Using one of the greatest artificial sources of radiation energy, University of Nevada, Reno researcher and faculty member Roberto Mancini is studying ultra-high temperature and non-equilibrium plasmas to mimic what happens to matter in accretion disks around black holes. What does this website mean? An emailer recently sent an address for the JOHNTITORFOUNDATION.COM. Does anyone have any idea what these numbers and dates mean? As town halls unfolded across the country without incident, San Diego Sheriff Bill Gore took it upon himself to place military equipment used in Iraq to repel terrorists, at two San Diego events. The device is also used by the U.S. Navy to repel terrorists from ships. JOHN SAID: The mass and gravitational field of a microsingularity can then be manipulated by "injecting" electrons onto its surface. By rotating two electric microsigularities at high speed, it is possible to create and modify a local gravity sinusoid that replicates the affects of a Kerr black hole. In theory, adding matter to a black hole could make it spin fast enough to shed its event horizon, but previously, physicists have calculated that the spin of black holes has an inherent speed limit that prevents such shedding. Infalling matter can disrupt a black hole’s event horizon, exposing a ‘naked’ singularity. Their work suggests that the event horizon could then be disrupted and shed. 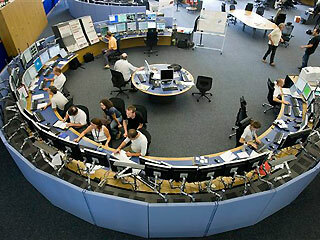 Video link to the visual image of Cern's black hole. Is the John Titor Movie Coming Out Soon? In a fawning interview last week, ABC's Diane Sawyer absurdly compared the problems Obama faces with those that confronted President Abraham Lincoln during the American Civil War. Sawyer then talked about how Lincoln often found time for prayer in his most trying times. Civil War in the USA? Deutsch himself has a theory of self-consistency, though he said he himself isn't completely happy with it. But one aspect of Deutsch's (and others') ideas is called the "relative state" or "many worlds" interpretation. It basically says that when a quantum state is measured, it takes on a single value for the observer, but all the other values are still equally real. Experiments with interference patterns seem to show this possibility - famously, photons sent through a set of slits show diffraction patterns that seem to indicate that a single photon can interfere with itself. In that case, paradoxes are partially solved because if you change the past you simply move over to a universe in which the past was changed; your old one hums along as it did before. The singularity is also a temporal one, so that it can be avoided. In theory, it is possible to escape from a black hole, although not by the same way you went in. On leaving the black hole you would find yourself either in a region of "negative space," the physical meaning of which is unclear, or in an entirely different universe. RESEARCHERS have proven that manure from deer infected with a form of mad cow disease is infectious. The startling finding is set to re-ignite debate on how a raft of deadly brain-wasting diseases, caused by minute misfolded proteins called prions, are spread among deer, sheep and cattle. The new variant of CJD linked to cattle has been blamed for killing 164 Britons, with more expected to die in the future. The disease has a 40-year incubation period. JOHN SAID: Do not eat or use products from any animal that is fed and eats parts of its own dead. However, the scientists have doubts that the health benefits of farmed fish outweigh a potentially deadly danger. "We are concerned that consumption of farmed fish may provide a means of transmission of infectious prions from cows with bovine spongiform encephalopathy to humans, causing variant Creutzfeldt Jakob disease ," they stated. First, fish could be carriers of the disease from eating infected meat products, even though the fish themselves are not obviously infected or sick. In addition, it is possible that eating prion-infected cow parts could result in fish experiencing pathological changes that permit the prion infection to be transmitted between the two species. "Before the band were formed, they were each visited by a strange traveller from the future. This traveller's name was John Titor JNR. John Titor JNR spoke about a world of peace and harmony in which Rock & Roll was the rule and there was no war, simply because Rock & Roll was just too interesting. John Titor JNR gave details of his father that had visited twelve years earlier, he told the band members everything about the future. Most importantly he told them how an evil witch from his time (2050) named 'Popan Disco' was searching for them to destroy them before they created the most important band in WORLD history." Check out the time and effort that went into this comic strip about John Titor and his life. The More Show, a UK talk show pursuing the unexplained and the truth with Kevin Moore, broadcast every other Wednesday at 1pm from the University of Glamorgan’s brand new radio station Tequila Radio. JIM MARRS' ABOVE TOP SECRET BOOK CHAPTER "DID JOHN TITOR COME FROM THE FUTURE?" Click below to view the John Titor Dossier and info about the book. US GOVERNMENT GOING TO WAR WITH US CITIZENS? JOHN TITOR, 02-08-2001 01:18 PM : The "enemy" that was attacked by Russia in the U.S. was the forces of the government you live under right now. ...the Obama administration is unfairly singling out conservatives and military veterans. But Napolitano said the reports are "not intended to infringe on anyone's constitutional rights by any stretch,"
"These higher-risk cattle are allowed to commingle with the U.S. herd, enter the U.S. food supply and enter the non-ruminant U.S. animal feed system..."
"Canada's BSE testing is voluntary, and based on the significant numbers of BSE-positive cattle detected under very limited testing, Canada's BSE prevalence rate is likely well above USDA's estimate," he pointed out. "The result is that the United States is assuming a much higher risk for the introduction of BSE than the negligible risk that USDA claims." "When people stopped talking about (CJD] you just think it's gone and away and you stop worrying about it." Sporadic CJD: The most common form of CJD, causing fifty to sixty deaths per year in the United Kingdom. It usually affects people middle-aged and older (45-75) but has affected people in their teens and early 20. Although it the cause is unclear, this form is not thought to be linked to infected food. Variant CJD: The form of the disease thought to be linked to BSE (mad cow disease) in cattle, and introduced to humans through infected meat. Few cases have been reported outside the UK. It affects younger people than the sporadic form, with the average onset age being 27. Genentic CJD: A very rare illness caused by an inherited abnormal gene. Latrogenic CJD: Also very rare, This is where CJD accidentally transmitted during the course of medical or surgical procedures. “I believe that our federal government has become oppressive in its size, its intrusion into the lives of our citizens, and its interference with the affairs of our state,” Gov. Perry said. “That is why I am here today to express my unwavering support for efforts all across our country to reaffirm the states’ rights affirmed by the Tenth Amendment to the U.S. Constitution. I believe that returning to the letter and spirit of the U.S. Constitution and its essential 10th Amendment will free our state from undue regulations, and ultimately strengthen our Union." ***Tune in to Oliver Williams live radio interview on World of the Unexplained Radio Program Sunday, March 21, 2009 at 10PM EST. 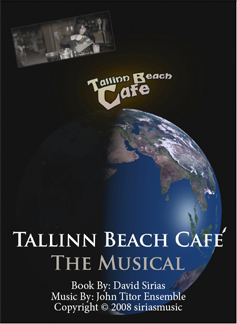 The John Titor Ensemble wrote and scored the musical Tallinn Beach Cafe. Featured on its website are a synopsis and the complete book for the musical, which features a young John Titor character, an old John Titor character, a soldier John Titor character, and a Titor sister character. Additionally, the song "Remember John Titor" was written for the musical. MUSICAL PREDICTING ANOTHER TITOR VISIT? "John's subsequent visit to Tallinn in 2012 marks the beginning of a putative hero's journey." -Tallin Beach Cafe. STILL WORRIED THAT THE LARGE HADRON COLLIDER WILL CREATE A BLACK HOLE THAT WILL DESTROY THE EARTH WHEN IT'S FINALLY SWITCHED ON THIS SUMMER? Rather, Roberto Casadio of the University of Bologna in Italy and Sergio Fabi and Benjamin Harms of the University of Alabama say mini black holes could exist for much longer  perhaps even more than a second, a relative eternity in particle colliders, where most objects decay much faster. Under such long-lived conditions, it becomes a race between how fast a black hole can decay  and how fast it can gobble up matter to grow bigger and prevent itself from decaying. "Concerning the identity behind John Titor, the mystery will go away and to those that don't want knowledge that may be considered a spoiler I recommend you do not view my blog or youtube page in the coming weeks..."
NEW AMERICAN TEA PARTY, A COALITION OF CITIZENS - SIMILAR TO 2036? "Were a coalition of citizens and organizations concerned about the recent trend of fiscal recklessness in government. On February 27th, we got a group of over 300 activists from around the country to participate in a big event resembleing the classic tax revolt that jump-started the American revolution. It was held AT noon, on February 27th, at Lafayette Square, by the White House, mere blocks from the Farragut North and McPherson Square metro stops. This isnt a conservative or liberal thing. We are not opposing any specific legislation or politician. We are instead addressing the broader philosophical implications of a government that has grown too large and too distant from the very citizens it taxes. This is scary stuff." An enlightening recorded live chat from the year 2000 in which John Titor himself participated, has re-appeared. Read the entire chat here. Special thanks to Kay E. for the contribution. Q: Your enemy was in the cities. Was the President in 2005 also on the enemy side? How did you feel personally about the President then? JT: The President or "leader" in 2005 I believe tried desperately to be the next Lincoln and hold the country together but many of their policies drove a larger wedge into the Bill of Rights. The President in 2009 was interested only in keeping his/her power base. STORY - Allen, the stage supervisor for Spears and several other rock stars, tells The Post he designed the set more to evoke images of the White House and the Lincoln Memorial, not the Acropolis. 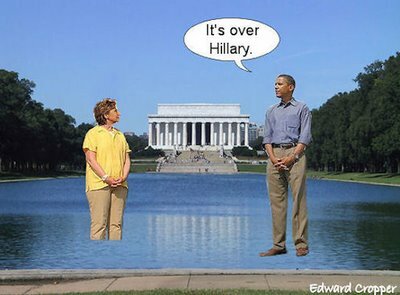 STORY - Many say that the ostentatious columned backdrop supposed to represent the Lincoln Memorial in Washington, D.C., invoking the image of Lincoln and associating it with Obama. China has drafted in specially trained 'spectators' to inject some atmosphere into the half-empty stadiums and echoing plazas of the Beijing Olympics. After denying there was any problem with attendances for several days (even claiming the events were "sold out") the Beijing Organising committee have confessed their worries at the poor turn out. "We are concerned about the fact we do not have full stadia," said Wang Wei. To fill the gaps the Chinese have been using huge numbers of yellow-shirted 'fans' who occupy blocks of empty seats, clapping and cheering equally for opposing teams. Armed with inflatable cheering batons, the neutral 'fans' who attended several days of pre-Olympic cheerleader training to prepare for the role, clap and chant wildly in unison. Events postponed for rain at Beijing Olympics -- included tennis, archery and rowing. Aussie athletes battle Beijing's weather -- The women's road cycling race turned treacherous in the wet weather, the exposed rain gutters lining the course near the Great Wall took their toll. The smog hanging over Beijing is getting so bad that the International Olympic Committee may have to consider postponing or shifting events. -Heat too much for gasping cyclists -- 53 riders call it quits. "It feels like you have hot cream all over your body." -O'Grady, who pulled out of the race blaming a headache with 45km left to race -- "It was like silent murder,'' he said. -If the event is cancelled because the atheletes state that they do not want to compete because of the polution, this will suffice for a 'Yes' settlement, regardless of what the IOC or Chinese Government reports. Chinese hush up serious injury to acrobat -- A Chinese acrobat has been seriously injured after she fell during a rehearsal for Fridays opening ceremony...lay in agony for more than 50 minutes before she was attended by paramedics...blamed by a performer on a combination of poor stage management and a failure to implement international-level safety standards...no sensation in her lower limbs after the fall and was in danger of being unable to stand for the rest of her life as a result of the injuries. 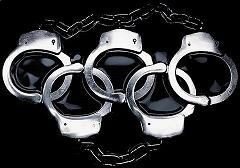 WITH NO FREEDOM OF PRESS, WILL THE WORLD EVER REALLY KNOW WHAT HAPPENS AT THE OLYMPICS? 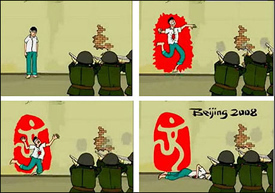 07/30/2008 - Beijing admits that even journalists will be subject to restrictions on the internet. The head of the IOC apologizes over broken promises, and concludes that what China says must be done. 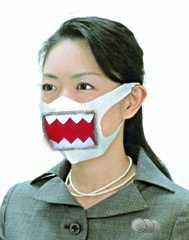 Meanwhile, the Japanese team is considering whether to come wearing dust masks. Beijing (AsiaNews/Agencies) - Official apologies has been extended to journalists by Kevin Gosper, head of the press office for the International Olympic Committee, because of Chinese censorship of their websites set up for the Olympics. The Olympic organizing committee (Bocog) has admitted that websites have been blocked that mention the spiritual group Falun Gong, banned in China as an "evil cult". For days, journalists have been complaining that their websites are being censored, but the Bocog defended itself by citing unspecified "technical reasons". Among the sites blocked are those that mention Tibet, Chinese dissidents, and human rights groups like Amnesty International and Reporters without Borders. Now Gosper, in an interview with the South China Morning Post, has apologized to the press for "misleading" them for seven years, guaranteeing that "there will be full, open and free internet access during Games time to allow journalists to report on the Olympics". He admits that he knew that "some of the IOC officials had negotiated with the Chinese that some sensitive sites would be blocked". And he concludes that, in any case, "I can't tell the Chinese what to do", "you are dealing with a communist country that has censorship. You are getting what they say you can have". In the recent Olympic Games history, from 1976 to 2004, the Olympic torch has died-out a total of six times, despite facing various weather conditions and obstacles. However, duringthis year's relay the torch has died-out so frequently that nobody can accurately recall the exact number of occasions. Police attack on press raises fears over Beijing coverage -- Video from Hong Kong -television stations showed Beijing police officers throwing one journalist to the ground and restraining him by the neck. Other officers pulled cameramen from ladders as they sought to record chaotic scenes surrounding Olympic ticket sales.. Hong Kong's journalist association yesterday accused Beijing police of "wanton violation" of press freedoms, saying China was breaking its promise to give reporters a free hand to cover next month's games. Networks Fight Shorter Olympic Leash - Had the I.O.C., and those vested with the decision to award the host city contract, known seven years ago ... then I seriously doubt whether Beijing would have been awarded the Olympics, the commissioner said. NBC Universal has taken out an insurance policy to protect itself against the disruption or cancellation of the Games. But NBC officials are not eager to discuss the peculiarities of broadcasting from China. Mr. Ebersol would not respond to a request for an interview, the network said. Chinese investigate bird deaths at equestrian venue -- Two dead birds were discovered at the Olympic equestrian venue in Hong Kong, Associated Press reports, and Chinese authorities are testing whether they were infected with the bird flu virus. 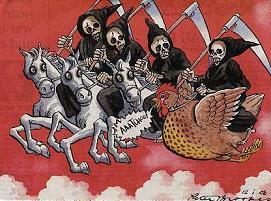 Hong Kong has struggled with bird flu over the years. Six people died during a 1997 outbreak. 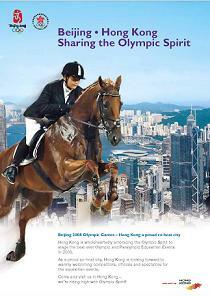 Focus on health of equestrian athletes -- Authorities will be on the lookout for for 10 common symptoms indicating a contagious disease displayed by any of the athletes taking part in the Olympic equestrian events in Hong Kong, health officials said. Equestrian event chief medical manager and Director of Health Lam ping-yam said there is no indication of an heightened risk of a terrorist attack, including bio-chemical attack during the Games. Typhoon strikes equestrian venue in Hong Kong -- Tropical Storm Kammuri hit Hong Kong in the early hours of this morning, and showed little sign of moving off in the evening, so any smugness about the climate relative to China's capital was swiftly and comprehensively washed away. 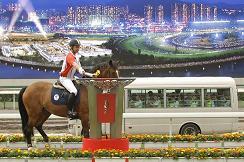 Olympic horses shiver in sub-tropical Hong Kong: report -- Horses competing in the Olympics will have had to contend with the city's sweltering heat, but so far they have just been suffering from icy air-conditioning, a newspaper said on Wednesday. China rights 'worsen with Games' -- The human rights situation in China has deteriorated in the run-up to its hosting of the Olympic Games this year, Amnesty International says. Chinese border assault kills 16 -- an event that has put security forces nationwide on alert and that at least one militant Muslim group has vowed to disrupt. Xinhua, citing local police, called it a "suspected terrorist attack." China plans to spy on Olympic hotel guests: US senator -- "The Chinese government has put in place a system to spy on and gather information about every guest at hotels where Olympic visitors are staying," Kansas Senator Sam Brownback told reporters. JOHN SAID: After the war, the United States had split into five separate regions based on the various factors and military objectives they each had. There was a great deal of anger directed toward the Federal government and a revival of states rights was becoming paramount. The United States Constitution guarantees us numerous rights and liberties, but the ones most essential and inalienable are those of life, liberty, and property. As I am writing this entry, there are scores of constitution maggots in DC working to erode those very rights which we hold dear. The finest examples of this are the two pieces of legislation currently awaiting a vote: cap-and-trade and health care. Texas longs to be free today just as she has since the Spanish first explored her. She doesn’t deserve the confinement of an ever encroaching federal/ socialist system from distances far outside her borders. She deserves to be free and her people deserve independence. She deserves to be returned to her own. She deserves to be allowed to stand on her own, a bastion of freedom for the world to envy. Let her stand on her own. She is freedom. She is Texas! EYESVIEW PRODUCTIONS - Tracking John Titor? One day, scientists may create the ultimate tempest in a teapot — an artificial black hole in a millimeter-long gadget. Such laboratory-grade black holes may illuminate enigmatic physical properties of their wild galactic counterparts, all from the safety of a lab bench, a study to appear in Physical Review Letters suggests. Changing the strength of the horizon-creating magnetic pulse may create conditions that fluctuate, making a system that simulates “shaking spacetime,” Nation says. Watching how photons behave in such a quantum system may answer some basic questions about the quantum nature of gravity, he says. I saw a bumper sticker the other day: "I love my country but I am afraid of the government." I turn on the TV and there are town meetings with people who are very frightened, angry and frustrated about the bills being rushed through Congress. Then I hear our employees, the president, speaker of the House, congressmen, senators calling us names - "fakes, rent-a-mobs, cronies of the insurance companies." Now I am afraid of the government. OLIVER WILLIAMS: Maybe some day this won't be an April Fool's joke? It looks like CERN has a sense of humor. It’s interesting that they mention the black hole as a requirement for time travel. It looks like CERN knows about John! "I can confirm that, yes, the first stages of the experiment resulted in the appearance of a miniscule black hole," said the spokesperson to gathered reporters on Monday. "The black hole is being kept under quarantine and our scientists have been monitoring its progression," he explained. 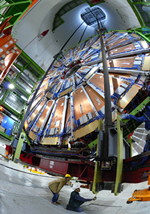 Many had bitterly said the consequences could be as extreme as the Earth being sucked into the black hole the LHC collisions may create as a side effect of the experiment. Others claimed time travellers with more sophisticated technology than ours could make use of the hole to invade the Earth and enslave mankind. JOHN TITOR, 02-06-2001 08:33 AM : The attack on Europe is in response to a unified European army that masses and moves East from Germany. A security blueprint charting a path to a European Union army will be agreed by Euro-MPs on Thursday. The plan, which has influential support in Germany and France, proposes to set up a "Synchronised Armed Forces Europe", or Safe, as a first step towards a true European military force. JOHN TITOR, December 13, 2000 12:44: The Jewish population in Israel is not prepared for a true offensive war. They are prepared for the ultimate defense. Wavering western support for Israel is what gives Israel's neighbors the confidence to attack. The aerial drill, named "Milad-e Nour-e Velayat," will involve Iranian fighter jets and interceptor aircraft to perform combat operations over a distance of 3,000 kilometers in four stages, the report said. The Iranian maneuver, one of some conducted in the past few months, comes amid growing speculations of a possible Israeli attack against the country, Press TV said. Israeli air force conducted an exercise in mid-May, which simulated missile attacks on Israeli cities from countries including Iran and Syria. Israel's daily Ha'aretz quoted Israeli Defense Minister Ehud Barak as saying that the drill conducted by his country's military helped show Israel's preparedness for regional war conditions. It revealed how well Israel could defend itself on multiple fronts should war break out with regional powers such as Iran and Syria, Barak said. The President will use a meeting with Mr Netanyahu in Washington on Monday to tell him that from now on Israel must earn its privileged relationship with America. Mr Obama will make clear that he will not allow his foreign policy objectives to be dictated by the Jewish state's interests, and that its leaders must resume working for peace with the Palestinians. Obama also said he would "personally pursue" a drive to set up a Palestinian state alongside Israel, a solution backed by Mubarak and other Arab states but not by Netanyahu. A MESSAGE FROM OLIVER WILLIAMS: John told us that civil war would be coming to the United States. Many have criticized John because events have not unfolded exactly the way John said. Others have pointed out that John also said his timeline and ours were slightly different. John also said that when the war came, there would be plenty of guns available. Is civil war coming as John said but just a few years late? The state of Montana has decided to pick a fight with the Federal Government. The Montana State Legislature recently passed legislation, which was signed into law by the Democratic Governor Brian Schweitzer, which exempts citizens of Montana from federal background check requirements if a gun was made in Montana, sold to a resident of Montana, and intended to remain within Montana. The idea behind this is that if the gun remains within the state then the commerce clause of the U.S. constitution does not apply and the Federal Government would not be allowed to regulate the sale or distribution of these firearms. This is an interesting concept, and is sure to generate a fight. This one could get really ugly, really fast. 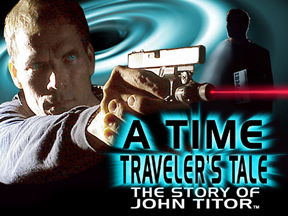 Film company in Orlando Florida has taken up the task of tracking down John Titor on video. To get the entire story from the beginning, start at the first site where the “Hoaxhunter” presented “evidence” that John Titor doesn’t exist and then go directly to the film companies video blog as they track the evidence down. Fueled by rumors that the Obama administration will ban assault weapons and heavily tax ammunition, gun enthusiasts are stocking up. Handguns, semiautomatic weapons, and all types of ammunition are flying off store shelves, despite the recession. A MESSAGE FROM OLIVER WILLIAMS: When John first started posting about the details of his time machine, he made specific reference to mini-black holes the size of mountains, that time travel is basically moving between alternate but similar realities, a black hole needs to be spinning in order to travel through it, and that a time travel trip is one way from your original starting point. Once again, it looks like science is finally catching up with John. Hawking also described how black holes seem to conflict with one of the fundamental ideas of science, namely determinism: That is, given enough detail about the state of the universe at present one can predict the future and reconstruct the past. The fact that black holes can absorb matter and then emit something completely different means that black holes appear to undermine determinism. However, Hawking believes he has found a resolution in the ideas of Richard Feynman, who believes that quantum theory involves looking at all possible alternative histories. This perspective also supports the idea that if you fall into a black hole, you may come out in another universe. If there is a large hole and if it is rotating, you may pass through it and into another universe. So, you cannot come back to our universe. JT - November 07, 2000 21:23 - Yes we have phones but the service is through the web. There is a catch, though. Google’s free e-mail service, Gmail, is supported by advertising based on the content of messages, and a similar model could eventually be used for Google Voice. So, a phone chat about football could result in you receiving ads for tickets to the Super Bowl, or you might talk to the doctor and then get e-mail from an online pharmacy. The land of the free may yet decide that when privacy is at stake, some things are a step too far. WEBSITE BASED ON TITOR MULTIPLE UNIVERSE THEORY FEATURES "MULTIVERSE NEWS ANALYSIS"
John Titor News incorporates multiverse theory by taking into account the probablistic distance from the present worldline when analyzing alternate interpretations of reality. In a system of multiverses in which according to John Titor everything that can happen does happen somewhere, some worldlines must of necessity be more similar and therefore less 'far away' than others. John's term for this was 'divergence' and it could be at least approximated if not measured as a kind of percentage difference from one's original worldline. John Titor News therefore works as a kind of mass consensus generator, which is how reality is generated anyway -- by the preponderant forces of mass perceptions, beliefs, and desires. We take your opinion if you care to give it and we don't care if you don't so it is all up to you to decide whether you want to have a voice in your future or not. A MESSAGE FROM OLIVER WILLIAMS: It's hard to believe it's been six years since I first put this website together. For those of you who make regular trips here, I apologize for not keeping up with it lately. Like many of you, I run hot and cold with John and I tend to update the site when I get that creepy feeling he may have been exactly who he said he was. Well, I’m getting that feeling again. Please notice the new video I posted (click here or in the window to the right). It’s the full length version of the podcast tease I had up for a while. I know its a bit old but I’m considering trying to put a full length version up on a regular basis. 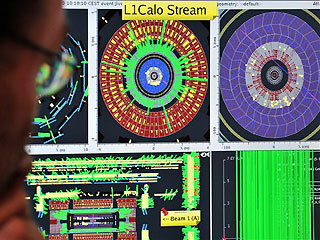 In the news, take a look at what’s happening at CERN. It now appears there may be some real concerns about an artificial black hole being created. Again, it’s another example of what John had said all along while scientists pooh-poohed the very idea it was possible. With the collapse of the stock market, the changing economy and the loss of jobs, isn’t it just a little jolting to see how many people are discussing the possibility of civil conflict in the United States? Also of interest, a very committed debunker named Razimus claims to know who John Titor is. A few weeks ago, he started a blog and posted evidence he claimed narrowed down the people who made the original posts. I’m proud to say I made the top ten. Unfortunately, he admits to making a few mistakes that may have muddled his results and cost him some credibility. I would suggest trying to figure out “how” it was done which would probably lead to “who” did it. If John wasn’t a time traveler, whoever he/she or they were knew about physics, the IBM 5100, they had an ability to create documents or at least hide the true nature of real documents, and they had a pretty good knack for making statements about the future that people still argue about. SECOND AMERICAN CIVIL WAR IN THE WORKS? A growing number of states rebelling against the Federal Government. This map shows a growing number of states that have passed and propose resolutions to assert the Tenth Amendment and the Bill of Rights of the Constitution. Short of a full out revolution there may not be much else Americans can do. Washington, New Hampshire, Arizona, Montana, Michigan, Missouri, Oklahoma, California, and Georgia have all introduced bills and resolutions declaring sovereignty under the Tenth Amendment. Colorado, Hawaii, Pennsylvania, Arkansas, Idaho, Indiana, Alaska, Kansas, Alabama, Nevada, Maine, and Illinois are considering such measures. Feb 19, 2001, JT: The President or "leader" in 2005 I believe tried desperately to be the next Lincoln and hold the country together but many of their policies drove a larger wedge into the Bill of Rights. The President in 2009 was interested only in keeping his/her power base. Gun control is not the answer - Obama Administration's assault on assault weapons attacks 2nd Amendment. "Fear the government that fears your gun." Will Congress Take Your Guns? The guys with guns make the rules..."
Protecting Free Speech. "I urge my colleagues to reject any renewed institution of the Fairness Doctrine, which is nothing more than government controlled censorship." Obama's Challenge: What Would Lincoln Do? Their crises were different, but the responses of Presidents Abraham Lincoln and Barack Obama bear striking parallels, historians say. Bipartisanship is out: Political parties have fissiparous tendencies for a reason. Lincoln, Obama's role model, was not bipartisan. In fact, it is said that in his 1864 reelection, Lincoln did not get a single vote in five southern states--- not even one crank voted for him. He refused to negotiate or compromise and was a polarizing figure like no other we know today. Faced with a moral and military crisis, Lincoln did what he had to do, and stood for what he believed rather than talk of bipartisanship. In turning hard left, Obama is certainly following that model, and people should have no illusions about it. SPRINGFIELD, Ill. -- President Barack Obama urged Americans on Thursday to follow Abraham Lincoln's example of being generous to political opponents and valuing national unity above all else, especially in tough times. 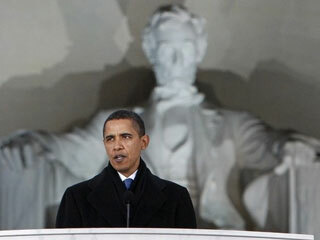 Presidential historian Doris Kearns Goodwin said Obama's actions reflect his genuine affinity for Lincoln. "It's a good thing to have Lincoln as your mentor," Goodwin said. On Lincoln's 200th birthday, in the latest of a long series of tributes to Lincoln, Obama cast Lincoln as the avatar of union - that is, of commitment to the collective effort that removes the fetters from individual effort. The left sees every area of society as a battleground, and they will use any and every tactic at their disposalincluding violenceto achieve their aims. Gangs Could Spoil Obama's Party - Gang violence and looting could ruin Barack Obama's party in Chicago if he wins the US election. Police fear riots if Barack Obama loses U.S. election - Meanwhile, in a blog posting entitled 'A McCain "Win" Will Be Theft, Resistance Is Planned', David Swanson, Washington director of Democrats.com and a board member of Progressive Democrats of America, writes: "If your television declares John McCain the president elect on the evening of November 4th, your television will be lying. "You should immediately pick up your pre-packed bags and head straight to the White House in Washington, DC, which we will surround and shut down until this attempt at a third illegitimate presidency is reversed. Are Riots Being Planned for November 5? JT: In 2015, Russia launches a nuclear strike against the major cities in the United States (which is the "other side" of the civil war from my perspective), China and Europe. Q: I think Russia is still very likely to attack the United States with nuclear weapons. It's hard to imagine being here to see it. JT: You are also correct but I want to add a twist to your thinking. Russia's enemy in the United States is not you, the average person. Russia's enemy is the United States government. Russian NATO envoy Rogozin says poor relations between Russia and the alliance over Georgia remind him of tensions in Europe on the eve of World War I. He also compares Georgian President Mikheil Saakashvili with Serbian nationalist Gavrilo Princip, who assassinated Austrian Archduke Ferdinand and thus triggered World War I. Rogozin made the statement Tuesday in at least two different forums - in an interview with Russia's RBK business daily and at his Interfax news conference, where he said the stakes today are much greater than merely Russian cooperation with the West. Pavel Felgenhauer says the implication of Rogozin's statement is the prospect of World War III and a possible nuclear exchange. Tonight, August 28, 2008, Oliver Williams, webmaster of JohnTitor.com, appears on Coast To Coast AM Radio Program Hosted by George Noory. Larry Haber, Titor family attorney, is also scheduled to appear. The Georgian conflict ended 1,716 days of no war between nations. But trends favor peace...With the news so full of violence, you may not have noticed that the world was at peace. But ever since India and Pakistan signed a cease-fire in November 2003, there have been no wars between governments. That's 1,716 straight days of world peace. Russia's invasion ended the streak on Aug. 8. Let's talk about World War III - It is time to seriously contemplate World War III. The most important elements are already in place. Just as so many experts on the Caucasus have predicted, the region has become a power keg and the main source of great-power rivalry. Drifting Toward World War III - World War III is pretty much a lock. South Ossetia: How close is World War III? - starting what could develop into World War III. Mathematicians Irina Aref'eva and Igor Volovich said that when the LHC begins to smash atoms into each other the conditions will be perfect to open a wormhole into the distant future. 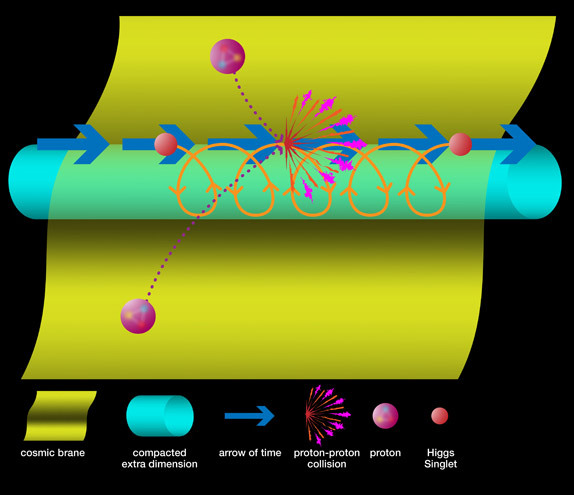 "Proton-proton collisions at the LHC could lead to the formation of time machines (space-time regions with closed time-like curves) which violate causality," said the scientists in a research paper. "One model for the time machine is a traversable wormhole. We argue that the traversable wormhole production cross section at the LHC is of the same order as the cross section for black hole production." The other possibility, according to the mathematicians, is that miniature black holes will be formed under the French and Swiss countryside. Geneva, 25 August 2008. CERN has today announced the success of the second and final test of the Large Hadron Colliders beam synchronization systems which will allow the LHC operations team to inject the first beam into the LHC. The first attempt to circulate a beam in the LHC will be made on 10 September at the injection energy of 450 GeV (0.45 TeV). This historical event will be webcast HERE. BEIJING OLYMPICS NOT REAL? Fake Fireworks, Bogus Fans & Lipsynching Leave the World Wondering...What Else is Phony? 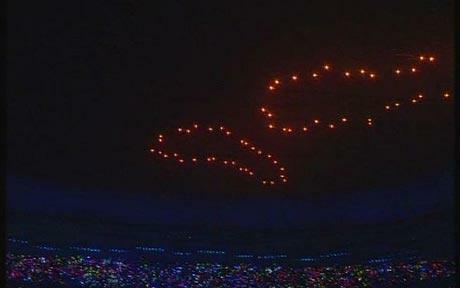 Will the Opening Ceremony Fakery Never End? Adorable Moppet Was Lip-Syncing -- 7-year-old Yang Peiyi, who won a nationwide singing competition, was replaced at the last minute when a Chinese official, watching rehearsal, declared that Yang's buckteeth made her unsuitable to appear on television. Now Lin Miaoke is China's newest star, appearing on television all over the place. Beijing Olympics: Faking scandal over girl who 'sang' in opening ceremony -- At the last moment a member of the Chinese politburo who was watching a rehearsal pronounced that the winner, a girl called Yang Peiyi, might have a perfect voice but was unsuited to the lead role because of her buck teeth. "Especially at the entrance of our national flag, this is an extremely important, an extremely serious matter. First the fireworks, now the fake singing. All our Olympic dreams are shattered - Please tell me that Michael Phelps' three gold medals were not fake. Because it turns out that the Opening Ceremonies may have been a hall of mirrors. Olympic child singing star revealed as fake --The little girl who starred at the Olympic opening ceremony was miming and only put on stage because the real singer was not considered attractive enough, the show's musical director has revealed. Pigtailed Lin Miaoke was selected to appear because of her cute appearance and did not sing a note...But Chen said the girl whose voice was actually heard...during the spectacular ceremony was in fact seven-year-old Yang Peiyi, who has a chubby face and uneven teeth. "The reason why little Yang was not chosen to appear was because we wanted to project the right image, we were thinking about what was best for the nation," Chen said. SPECTACULAR BEIJING OLYMPIC CEREMONY GIANT FIREWORK FOOTPRINTS "FAKED"
Gao Xiaolong, head of the visual effects team for the ceremony, said it had taken almost a year to create the 55-second sequence. Meticulous efforts were made to ensure the sequence was as unnoticeable as possible. "...most of the audience thought it was filmed live - so that was mission accomplished." A spokeswoman for BOCOG said the final decision had been made by Beijing Olympic Broadcasting, the joint venture between the International Olympic Committee and local organisers that is responsible for providing the main "feeds" of all Olympic events to viewers around the world. Did NBC Alter the Olympics' Opening Ceremony? you can see that the order in which the countries were presented was very different from the actual order of the countries in the ceremony. 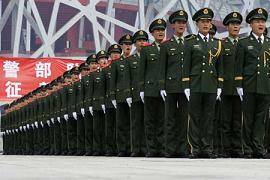 AMID TERRORISM, SPYING, & SMOGGED-OUT EVENTS -- IS BEIJING HOSTING A "TRUE" OLYMPICS? BEIJING  A Chinese man wielding a knife attacked two American tourists related to an American Olympic coach on Saturday, killing one of the tourists and wounding the other and their Chinese tour guide while the three were visiting an ancient tower in central Beijing. The attacker then killed himself by eaping from the tower, Chinese officials said. Xinhua identified the attacker as Tang Yongming, 47, from the city of Hangzhou in Zhejiang Province. The CBS Evening News reported that in an incident resulting from "high anxiety" or "perhaps high security" or "maybe just simple pettiness, the plane carrying White House staffers and White House press corps landed at the Beijing airport as scheduled and was forced to sit on the tarmac for three hours in the middle of the night before being able to unload." Would-be protestors must apply at least five days before the planned protest and fill out an application that specifies the purpose and time of the protest, what will happen during it, the slogans that will be written on banners and posters, the estimated number of protestors and whether megaphones or any form of amplified sound equipment will be used. Protests that threaten the territorial unity of China are illegal, so that means no rallies by people advocating greater autonomy or independence for Tibet. The episode entitled "Hunting of John Titor" aired May 19, 2008 in Italy. The hour-long program hosted by Roberto Giacobbo features a visit to Florida in the United States in the quest to uncover the mysteries of the alleged time traveler. Video of 10/15/2007 Titor Episode of "Voyager"
The deleted scene of Titor attorney Larry Haber's interview for the film, "Obsessed and Scientific." 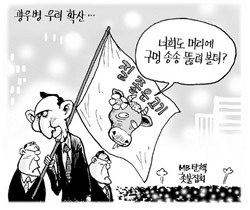 More Madness: Now Korean Beef is Being Scrutinized...KBS' "News Issue Ssam" news program recently showed a sick cow being sold on the black market and heading to a slaughterhouse. According to a livestock trader in an accompanying interview, the slaughtered cow would be sold for human consumption. Police say they will punish organizers of candlelight vigils held against U.S. beef imports...They have also secured the IDs of 21 Internet users who spread groundless rumors related to mad cow disease on the Internet in hopes of identifying them. DID TITOR PREDICT 2007 EARTHQUAKE IN PERU? JT: "I might even decide to tell you about an earthquake in Peru but then people that would have died by chance will now live and vice versa." STORY: "On Aug. 15, 2007, an 8.0-magnitude earthquake struck off the coast of Peru, leveling swaths of the port cities of Pisco, Ica and Chincha. Hundreds of people were killed, thousands left homeless." STORY: "The powerful 8.0 magnitude earthquake hit the southern coastal province of Ica in Peru last August killing over 400 people and injuring another 1500. More than 16,500 people were displaced or otherwise affected by the quake." JT: "The year 2008 was a general date by which time everyone will realize the world they thought they were living in was over. The civil war in the United States will start in 2004. I would describe it as having a Waco type event every month that steadily gets worse. The conflict will consume everyone in the US by 2012 and end in 2015 with a very short WWIII. " STORY: The investigation into the polygamist sect has drawn some comparisons to another controversial church raided by federal agents 15 years ago. JT: "In 2015, Russia launches a nuclear strike against the major cities in the United States (which is the "other side" of the civil war from my perspective), China and Europe." STORY: President Dmitry Medvedev made his debut as the commander in chief of Russia's armed forces Thursday, touring a missile base and promising to provide the funding needed for nuclear forces to counter global threats. IOC Admits Beijing Pollution Could Affect Health, Performance - The IOC acknowledged for the first time that "air pollution could affect the health and performance of athletes"...also said it "would monitor air quality daily during the Games to determine whether to postpone certain outdoor events." 2006 Story - Runner Collapses During Race and Dies in Hong Kong -- William Ko, chairman of the event organizer, the Hong Kong Amateur Athletic Association, had dismissed concerns that there were insufficient doctors and first aid staff to help runners. He also defended the decision to stage the race amid the worst air pollution in Hong Kong since last September. U.S. cyclists fly into China with face masks -- The IOC has said it would reschedule events that last more than an hour, if air quality was bad on the day. Olympic Athletes Wearing Masks Could Cause China to Lose Face -- Concerned about the pollution, the U.S. Olympic Committee is distributing a high-tech mask, developed in secrecy, to its more than 600 Olympians. Masked cyclist: 'I'd do it again' -- After official apologies, "I will continue to wear my mask where I deem fit." 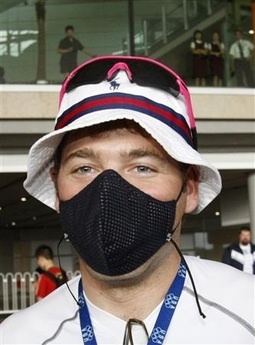 Japans Air Purifier: Olympians to Wear Dust Masks! Research to let Kiwi athletes breath easier in Beijing -- "We heard stories about yachties being surprised at what floats past them and we heard of an Australian who fell in with a cut and developed long-term health problems as a result. 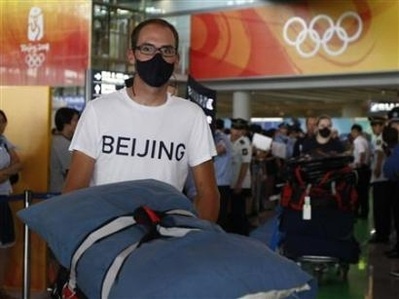 Olympic Teams Vying to Defeat Beijings Smog -- Colby Pearce, 35, an Olympic hopeful in track cycling from Boulder, Colo., said he saw smog floating inside the velodrome in Beijing. 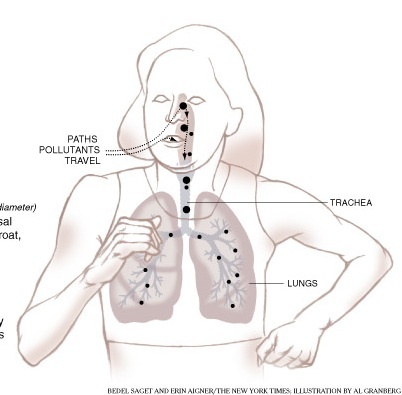 His throat became scratchy and he developed bronchitis, he said, because of air pollution. Endurance athletes fear permanent damage -- Beijing is a city where, according to one U.S. expert, 24,000 people die every year because of pollution. Last year, only eight of 50 competitors finished a world-class mountain-biking race on a bad day in Beijing. China's Anti-Pollution Efforts Failing, Olympics Emergency Plan Announced -- Testing at the Olympic Village revealed one pollutant at levels three times the recommended limit. Beijing's Pollution Registers Hazardous with Olympics Nearing -- Beijing's pollution reading at the Olympic zone yesterday reached 500 -- five times the city's benchmark. By its own scale, that represented ``heavily polluted'' air. China dismayed at Australia's smog 'boycott' -- many first-time visitors are shocked by the impenetrable brown blanket that covers most of eastern China most of the time.On days of atmospheric "inversion" or Gobi Desert sandstorms visibility is reduced to 500 metres. Meterologist: Beijing concern is heat, not pollution -- Beijing's heat, humidity and solar radiation levels were higher than the international guidelines for safe participation in sport. Race 'insane', says Stuart O'GradyVal Msccio -- STUART O'Grady says the 245km road race at Beijing poses a massive health risk to the entire 145-man peloton. 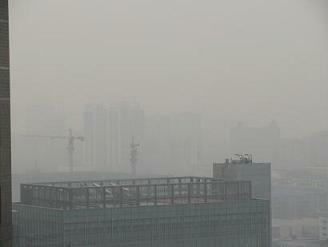 SMOG VIDEO 5: Olympics '08: Is Pollution Returning? SMOG VIDEO 7: Pollution clouds Olympics -- Athletes are concerned about the toll Beijing's pollution will take on their health during their Olympic visit. 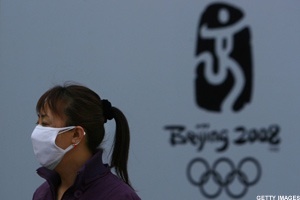 BEIJING OLYMPICS TO BE CANCELLED? Scrambling to recover from a devastating earthquke, China finds its Beijing Olympics plagued by political boycotts, an increasingly deadly disease, poor air quality, and possible terrorist threats. Is John Titor's prediction coming to pass? A Chinese association based in Washington wants the Olympic Games cancelled, in the wake of Monday's earthquake in China's Sichuan province. The death toll now stands at almost 15,000 people, affecting seven Chinese provinces. But many believe the toll is as high as 40,000 missing or dead. 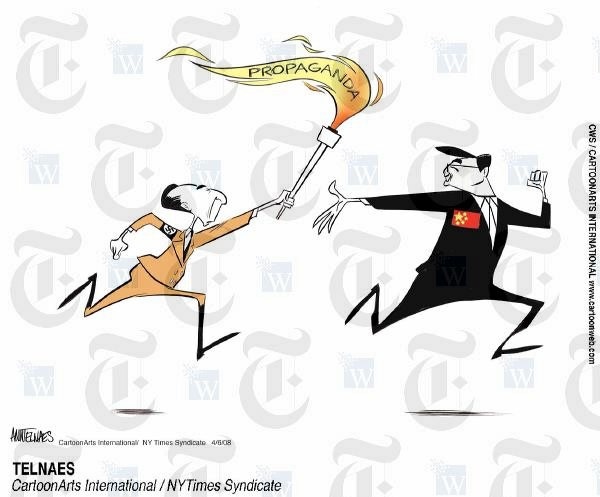 President of the Overseas Chinese Democracy Coalition, Wei Jingsheng, wants the international community to support his call for cancellation of the Games, or, at the very least, the opening ceremony. He says the world should not be celebrating, while thousands of people are dead, dying or homeless. ...Other factors appear to have contributed to a change in the air in Beijing as the Games approach, replacing an atmosphere of excitement with one of gloom and suspicion. Earlier this year, Hollywood filmmaker Steven Spielberg dropped out of his role as advisor to the opening and closing ceremonies over China's link to the government of Sudan, blamed for genocide in its western province of Darfur. Then came the jailing of civil rights defender Hu Jia, which was denounced by critics of the communist party leadership as evidence of a crackdown on free speech ahead of the Games. Another black mark for China came when marathon world record holder Haile Gebrselassie said he was not prepared to "commit suicide" by taking part in the event in Beijing's polluted air. China has assured the 10,500 athletes coming to the Games that air quality will be acceptable and has drawn up a series of measures to honor its promise, including shutting factories and curbing traffic. But the government has been unable to meet its pledge to offer unfettered access to the country to reporters covering the Games. Tibet and areas surrounding the Himalayan region still remain off limits to journalists. China Child Virus Death Toll Up To 43...As of Wednesday, the hand, foot and mouth disease virus had sickened more than 24,934 children in seven Chinese provinces plus Beijing, Xinhua reported....The disease is expected to peak in the hot months of June and July. 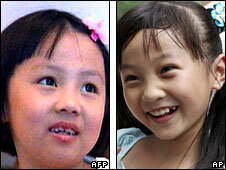 More Children Forecast to Die From China Disease...unusual symptoms that made it difficult to identify the virus. 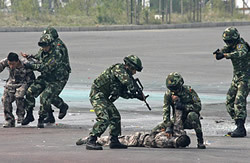 CHINA PREPARING FOR TERRORIST ATTACKS? 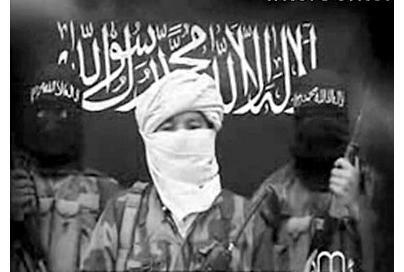 Interpol Warns of Terror Attacks as China Agrees to Meet the Dalai Lama..."We must be prepared for the possibility that al Qaeda or some other terrorist group will attempt to launch a deadly terrorist attack at these Olympics," Ronald Noble said. China Blocks Turks From the Olympic Games...Before the Olympics, China has blocked Islamic countries including Turkey in the Olympic games. U.S. Would Only Boycott Beijing Over Athlete Safety..."If there is a point that we cannot guarantee the safety of the delegation we would look at whether or not we would send a team," Scherr told Reuters. 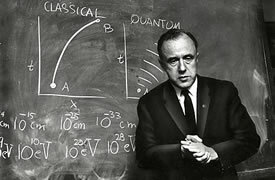 'Black hole' physicist and ACU benefactor dies at 96...Few people knew of the affection Dr. John Archibald Wheeler, known as the father of modern general relativity and the creator of the "black hole" term, had for Abilene Christian University's physics department. Are Black Holes Two-Way Streets?...Now, physicists from Pennsylvania State University in State College have shown that Hawking was right to change his mind. Will String Theory Be Proven at CERN?...if these ideas are right, this might well be the unified theory that Albert Einstein was looking for. Large Hadron Collider being constructed at CERN..."In general, I would say it is too soon to tell how the LHC will benefit humankind," Erbacher said in e-mail interview. "We often don't know how our discoveries will help us in the future until we've made them. Thisis indeed a pure research science." Building a Better Time Machine...UMass-Amherst professor David Toomey explores the serious time travel inquiries of theoretical physicists. JT: Far less medical treatment in the future even though It's more advanced. People die when they now its time to die. No lasers. Genetic medicine and cloning organs are the obvious new techs in the future. JT: 34. Cloning is not common. 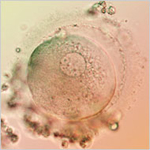 However, altering the sperm and egg cell are common. It is very difficult to have children in 2036 for environmental reasons. What's the future of cloning? JT: Cloning full people has been determined to be medically and ethically unsound. We do have research and progress in cloning body parts and creating more viable sperm and egg production. Britain OKs Hybrid Human Cloning Combining Animal and Human DNA..."In many ways we are like children playing with landmines without any concept of the dangers of the technology that we are handling," he said, according to a Press Association report. Disgraced Korean Scientist Establishes Pet-Cloning Firm...Hwang, whose breakthrough human cloning research was later proved to be faked, recently established a new research firm in Seoul, said Park Se-pill, a Cheju National University. Enter, the Cybrids...One of the provisions of the bill permits the creation of savior siblings...A third provision  and the most controversial of all  permits the creation of human-animal hybrid embryos, or cybrids, for medical research. OLIVER WILLIAMS ON COAST TO COAST! 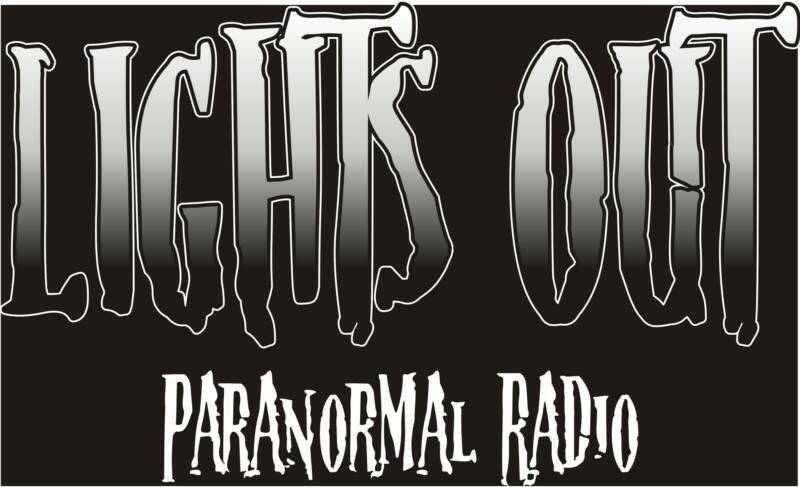 Thursday, March 20, 2008 Oliver Williams was on the Coast to Coast radio network with George Noory for the entire program. Click here to review other shows with Oliver Williams on Coast To Coast. WAS JOHN RIGHT? 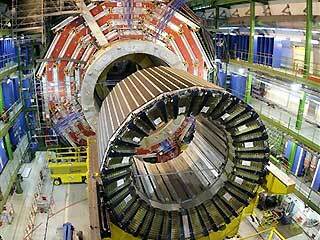 DOES TIME TRAVEL START AT CERN IN 2008? 2008: DOES TIME TRAVEL START HERE? AS YOU may have heard, this will be the year. The Large Hadron Collider - the most powerful atom-smasher ever built - will be switched on, and particle physics will hit pay-dirt. Yet if a pair of Russian mathematicians are right, any advances in this area could be overshadowed by a truly extraordinary event. According to Irina Aref'eva and Igor Volovich, the LHC might just turn out to be the world's first time machine. TIME TRAVEL START HERE THE WORLD'S FIRST TIME MACHINE? TUNNEL TO THE PAST COULD OPEN DOOR TO FUTURE WITHIN THREE MONTHS, SAY RUSSIANS. Time travel could be a reality within just three months, Russian mathematicians have claimed. They believe an experiment nuclear scientists plan to carry out in underground tunnels in Geneva in May could create a rift in the fabric of the universe. Peter Fisher answered viewer questions about particle smashing at the Large Hadron Collider (LHC) and much more on July 19, 2007. Please note that we are no longer accepting questions, but please see The Big Deal and our links and books section for more information. Q: Anticipating the world of knowledge that may be revealed when the LHC is in operation, what kinds of results do you think the LHC will provide (e.g., information on other dimensions or perhaps universes, the potential for new technologies, etc.)? Is what you expect to see different from what you hope to see? A: Actually, I'm not sure what to expect to happen at the LHC. We could see evidence for new universes or new dimensions, or something we did not expect at all. As far as technology is concerned, just building the accelerator and big detectors have pushed magnet technology ahead a great deal, not to mention computing, microelectronics, and superconductors. Q: Do you think the studies at CERN or elsewhere will be able to tell us more about space and time, or potentially make time travel possible? A: Perhaps: Several of the theoretical ideas relate our theory of gravity, which incorporates our ideas of space and time, with particle physics. So if we see certain kinds of new particles, we could learn more about the structure of space and time. Regarding time travel, it is very hard to say. Most of the ideas of time travel rely on your getting very close to incredibly massive objects (called "cosmic strings"). While it could be that the LHC tells us something about cosmic strings, actually using them to travel in time would be very difficult from a practical standpoint. A disturbing video of cows too sick to walk being pulled to their feet by chains in order to pass slaughterhouse inspections has prompted the largest recall of beef in American history. ScienceDaily (Mar. 19, 2008)  Researchers from the United Kingdom and France have identified four separate biochemical subgroups in a selection of cases of Creutzfeldt-Jakob disease. The study suggests that these subgroups could represent distinct prion strains in what is the most common human prion disease. After the country's first mad cow case was found in 2003, the federal government ramped up testing cattle for the fatal disease. But three years later, citing the "extremely low" incidence of the disease in the United States, officials all but eliminated that extra testing, scaling the costly program back by 90 percent. Today, about 40,000 -- or 0.1 percent -- of the 37 million U.S. cows slaughtered each year are tested, a number that consumer groups say is too low, especially when compared to testing programs in other countries. "Don't look, don't find" might be a more apt way of describing this country's testing program, said Michael Hansen, a senior scientist at Consumers Union. 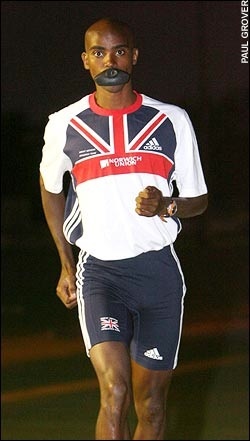 While he was online, John said there would be no official Olympics after 2004. Some point to this as proof he was not a time traveler. Is it possible John changed our time for the better and the Olympics did happen or was he referring to the 2008 games, the same time the shooting starts in the U.S. civil war. In either case, are voices now being raised for the U.S. to boycott the 2008 games? In 2001, John was asked if he remembered any poetry from the year 2036. John recited a few lines from a poem he called "A Soldier's Winter". He said it was written by a soldier, edited after his death and adopted as a symbol in the future. Now, in our time, A retired COL from the U.S. Army named Larry Cluck, has written a poem entitled "A Soldier's Winter" after John said it would be written! IS THIS PART OF A FEATURE LENGTH JOHN TITOR MOVIE? Larry Haber's office sent this link today. It takes you to a video sharing website similar to You Tube except you need to pay for some of the videos to watch them. One of the videos for sale is a five minute short film about John Titor. I did pay the $1.99 and downloaded it today. The film appears to be a short drama of John's meeting with his grandfather in 1975. It looks like the same film used to create the You Tube video. You have to watch it on a PC with WIndows 2000 or better (I found out the hard way). I must admit I was surprised to see how different my vision of this event was compared to what someone else put on film. The film isn't bad and it has a beginning, a middle and an end. I was a little confused about what I saw until I watched it again. I won't spoil the surprise. Again with the Z Machine? Could this be the cryptic method for cooling the time machine that John was suggesting? Sandias huge Z machine, which generates termperatures hottter than the sun, has turned water to ice in nanoseconds. However, dont expect anything commercial just yet: the ice is hotter than the boiling point of water. "The three phases of water as we know them  cold ice, room temperature liquid, and hot vapor  are actually only a small part of waters repertory of states," says Sandia researcher Daniel Dolan. "Compressing water customarily heats it. But under extreme compression, it is easier for dense water to enter its solid phase [ice] than maintain the more energetic liquid phase [water]." "This work," says Dolan, "is a basic science study that helps us understand materials at extreme conditions." WHAT DID JOHN TITOR KNOW? The "machine" with the energy to do it will come on-line very soon. The "method" for doing it has already ben "mostly" perfected in the Z machine at the National lab in New Mexico. Perhaps the most surprising black holes, however, are the ones in New Mexico. In Albuquerque, at Sandia National Laboratories, in and beneath a nondescript, flat-roofed compound, scientists have created an amazing piece of technology they call the Z Machine. Inside the Z Machine, power is discreetly siphoned from the city and drawn into concentric circles of enormous generators. Electricity from these numerous generators is then shot through switches, hurled into a vacuum chamber, torn across a vein-like network of fine steel filaments and blasted from every side into a miniscule space barely as big as a spool of thread. There, the machine's more than 20 million amps of electricity slam to a sudden, violent, fiery halt. And there, for an instant, that tiny space can get hotter than the inside of the sun. In the moment that follows, that captive little star collapses in on itself to become a miniature black hole - a man-made black hole, roiling, pitch-dark and deep, in the Duke City's suburbs. With increasing power since the late 1990s, the Z Machine has given scientists the chance to study the effects of intense radiation without having to detonate nuclear bombs. It has melted diamonds into puddles. It has allowed physicists to study the effects of black holes and types of stars on iron. It has taken scientists thrillingly close to harnessing the power of fusion - a clean, limitless, almost miraculous power. It has provided the potential to change our lives forever, or to end them. The black holes created by the Z Machine generally evaporate immediately, but if one ever happens to be stable, it might destroy the planet. When you take the square root of a negative number, you get an error in your calculator. The square root of a negative number i.e. -1 is demoted in mathematics as i, called the imaginary number. The mathematical functions surrounding the imaginary number are in the typical complex w plane. Mathematicians, physicists, and engineers deal with that in a subject matter called complex Numbers. When complex numbers are used to make interpretations in Physics, it is called the Complex Physics that is slightly off the mainstream physics. Scientists and engineers all over the world are busy extending the complex physics into the higher dimensions and black hole singularities. Some interesting correlations are coming out. The super string theory fits like T in the Complex Plane around a Limit Cycle around the singularity of black hole. The computer simulations now confirm existence of higher dimensions. The black hole is the entry door to the higher dimensions from our 3-D space time curvature. Astrophysicists were able to simulate the head-on collision of two black holes three decades ago, but computing the paths of orbiting black holes and their violent merger proved much harder. Gravitational wave fingerprint in black hole mergers questions the contemporary physics about its real validity. Finally scientists and skeptics are forced to look into the aspects of the multidimensional time. The special dimensions can be infinite. However, it is a definite signal for confirming the string theory. The amount of energy required to shake up the fabric of the space-time curvature is only available when two black holes merge violently. The spectacular event actually sends gravitational ripple effects all over the universe. The equations of general relativity can be easily written down but are notoriously hard to solve. Astrophysicists were able to simulate the head-on collision of two black holes three decades ago, but computing the paths of orbiting black holes and their violent merger proved much harder. When all said and done physicists now are perplexed  how little we know about the actual fabric of space-time curvature! It has always surprised me why that concept is so hard for people to imagine and accept. Nothing would happen. The universe would not end and there are no paradox problems that threaten existence. Temporal space-time is made up of every possible quantum state. The Everett Wheeler model is correct. I have met and/or seen myself twice on different worldlines. The first was a training mission and the second is now. I was born in 1998 so the other "me" is 2 on this worldline. There is a saying where I come from, "Every possible thing that can happen or will happen has already happened somewhere". It may seem impossible, but time travel could be a real possibility, and with that possiblity coumes a slew of difficult philosophical questions. Beyond the physical aspects of time travel are the philosophical problems that could arise if people went back to the future. There are two main paradoxes John Carroll, professor of philosophy, covers in his class on time travel: the "grandfather paradox" and the "self-visitation paradox." The grandfather paradox examines what would happen if someone went back in time and killed his or her grandfather before his or her father was born -- the problem then arising, how could the killer be born? The self-visitation paradox plays the mind game that if someone went back in a time machine he could visit himself. These examples focus mainly on a one-dimensional travel experience, meaning a person can only travel forward and backward in one pathway. But with the introduction of string theory became the possibility of a multidimensional universe and multidimensional time travel. Samuel Harward, a senior in mechanical engineering, is working on an honors independent study on multidimensional time travel. "It is branching," he said. "Every option that could occur does occur, so whatever path you take is what you are experiencing." This possibility of a "multi-verse" can lead to an identity paradox -- the problem that if infinite world options of a person exist, which option is actually the person? Where does his or her identity exist? "Most of my students are thinking Back to the Future or Bill and Ted's ," Carroll said. "And they are surprised to see that physicists take it seriously now. There is a professor [Ronald Mallet] at the University of Connecticut who is claiming to be building a machine to go backward." How can you possibly criticize me for any conflict that comes to you? I watch every day what you are doing as a society. While you sit by and watch your Constitution being torn away from you, you willfully eat poisoned food, buy manufactured products no one needs and turn an uncaring eye away from millions of people suffering and dying all around you. Is this the "Universal Law" you subscribe to? Responding to questions from Sen. Arlen Specter at a Senate Judiciary Committee hearing on Jan. 18, Gonzales argued that the Constitution doesnt explicitly bestow habeas corpus rights; it merely says when the so-called Great Writ can be suspended. There is no expressed grant of habeas in the Constitution; theres a prohibition against taking it away, Gonzales said. Gonzaless remark left Specter, the committees ranking Republican, stammering. Gonzales continued, The Constitution doesnt say every individual in the United States or citizen is hereby granted or assured the right of habeas corpus. It doesnt say that. It simply says the right shall not be suspended except in cases of rebellion or invasion. Other cherished rights  including freedom of religion and speech  were added later in the first 10 amendments, known as the Bill of Rights. As most of you have seen, it's been a while since I've updated the site. Usually, when I update the site, I make a few checks on the web and add one or two stories relating to what Mr. Titor had to say. However, in the last few months, there have been so many things happening and developing that I'm overwhelmed by the information. In frustration, I've been trying to find a way to simplify the site so I can make changes faster. This of course is my own fault. The site worked great before I tried to jazz it up with graphics and buttons and lists and links and... well you get the point. So no, I have not given up on the site. I'm in the process now of trying to streamline it and make it easier to read. In the meantime, I've listed just a few items that may be of interest. CALGARY, AB, Canada (UPI) -- Canadian researchers have found a cancer-fighting virus called VSV kills the most malignant form of brain cancer in mice. A spinning gravity device is described by DIA Source 011 in Project 8914-I from 1989. "The second object/device is quite unusual, even a little bizarre...this object is very large and tall, it spins around a vertical axis, counter-clockwise, like a gigantic gyroscope. This device can spin at incredible speeds... this effect is more of an illusion than a reality, which is caused by warping time and space... Device: reaches maximum RPM, waves of energy are being drawn into the center/core ... this energy appears to be electromagnetic in nature ... drawn from the ultraviolet (purple) end of the spectrum ... concepts associated with object/device are; research, energy, space, time, warping of space and time, atomic, sub-atomic, and the idea of a breakthrough in physics. This energy/force seems to be related to the force we call gravity, but not gravity as we currently describe and understand it at present..."
"You have an exciting two years ahead of you", said Prof. Hawking as he congratulated Robert Aymar, the Director General of CERN, and the CERN community for their scientific work. During his visit, Prof. Hawking descended 100 metres underground to tour various facilities of the LHC. When asked what he considered to be the most important discoveries that the new experiments can make, Prof. Hawking commented, "There are three candidates: superpartners, black holes and the Higgs." He considers superpartners and black holes to be the most important findings. Computer models show singularities in black holes are much more complex than thought previously. These singularities manifest time and space interactions that is just impossible to overcome. However an in-depth model based on empirical studies manifest something interesting. 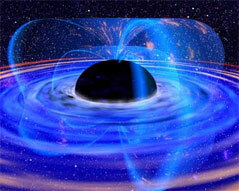 Black holes contains enormous amount of energy is very small space. The amount of energy concentration is so heavy that that it can detach space and time, as we know it. The detached time shows multidimensional characteristics. Sandias Z machine, by creating pressures more than 10 million times that of the atmosphere at sea level, has turned a diamond sheet into a pool of liquid. Since 2001, when he delivered a paper on using lasers to manipulate space and time, Ronald Mallett has been one of the leading figures in the theory of time travel. So if you do go back and change the past, "that past is not the time that you came from. It's the past in the new universe." IS THIS THE LIE IN 2005? Before John left our time in 2001, he warned us about a "lie" that would change our life in 2005. Is this it? Is this under-the-table agreement between Mexico, the US and Canada to form a "North American Union" the lie John spoke of? 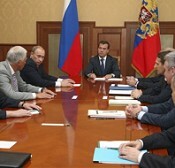 In the agreement, the plan will take shape in our country by 2010. What will this do to our constitution? How will it effect business in the US? How do they plan to stop terror attacks? Why hasn't Congress voted on this? Notice the date John told us Spanish was a lot more popular in Texas. It's exactly four years from the day when the agreement was signed by President Bush in Waco Texas. 2/19/01 - Q: Your enemy was in the cities. Was the President in 2005 also on the enemy side? How did you feel personally about the President then? JOHN: The President or "leader" in 2005 I believe tried desperately to be the next Lincoln and hold the country together but many of their policies drove a larger wedge into the Bill of Rights. The President in 2009 was interested only in keeping his/her power base. 11/15/00 - Q: Tell me anything like that and I will believe you forever. JOHN: It is a mistake to give anyone your unwavering belief...but you will find that out yourself in 2005. 3/24/01 - Q: One last question, how did Texas fare during the war? JOHN: Texas is still there but Spanish is a lot more popular. POAC/WRS Forum discussing the issue with good links. Despite claims to the contrary, a planned Midwest "inland port" with a Mexican customs office will not be restricted to railroad traffic, according to internal documents obtained by WorldNetDaily. As WND has reported, Kansas City SmartPort plans to utilize deep-sea Mexican ports such as Lazaro Cardenas to unload containers from China and the Far East as part of the North American Free Trade Agreement super-highway plan. The plan would include the hotly contested allowance of Mexican trucks on U.S. roads, WND has reported, but Tasha Hammes of the Kansas City Area Development Council has insisted the port will be restricted to railroad traffic. Hammes has argued the railroad link is "nothing new, other than the fact that Kansas City Southern acquired the Mexican railroad serving this port and that major work has been done on the port of Lazaro Cardenas so that it has higher capacity and can handle larger containers." But internal e-mails make it clear that officials, hoping to stay below the radar of public opinion, plan to expand from rail to trucks after the Mexican customs facility is operational. Pastor also was vice chairman of the May 2005 Council on Foreign Relations task force entitled "Building a North American Community" that presents itself as a blueprint for using bureaucratic action within the executive branches of Mexico, the U.S. and Canada to transform the current trilateral Security and Prosperity Partnership of North America into a North American union regional government. HAZLETON - The United States, to paraphrase Lincoln, is in the midst of a great civil war. So far, no shooting, but you never can tell. In Lincoln's time, a key issue was slavery. In our time, it's illegal immigration. Cities such as San Francisco, Los Angeles and Chicago have declared themselves sanctuaries for illegals and refuse to enforce federal immigration laws. Philadelphia Police Commissioner Sylvester Johnson last week said his cash-strapped department doesn't have the resources to chase undocumented workers. Other cities have promised to crack down on undocumented workers and enforce immigration laws when the federal government won't. It looks like a civil war. Remember when everything John said five years ago was nothing but science fiction? 2/14/01- JOHN: Fortunately, most black holes are not static. They spin. Spinning black holes are often referred to as Kerr black holes. A Kerr black hole has two interesting properties. 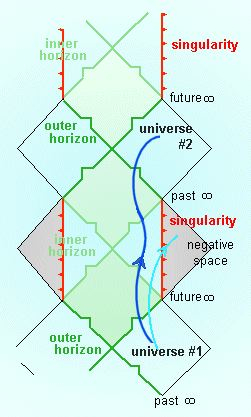 One, they have two event horizons and two, the singularity is not a point, it looks more like a donut. These odd properties also have a pronounced affect on the black hole's gravity. There are vectors where you can approach the singularity without being crushed by gravity. Another other more interesting result of passing through a donut singularity is that you travel through time by passing into another universe or worldline. Please see Penrose diagrams for Kerr Black holes or you can examine the calculations of Frank Tipler. ROTATING BLACK HOLE WITH TWO EVEN HORIZONS SPITS OBJECTS INTO PARALLEL UNIVERSE? The outermost edge of a black hole is the event horizon. That's the only definite part of a black hole. Size varies greatly among black holes, with smaller ones causing more distortion of space-time; space-time would have to wrap itself more tightly around a smaller one to close it off. A rotating black hole has two even horizons. Inside the first event horizon, it is just like a non-rotating black hole (the rotation, by the way, is from the rotation of the star before it collapses): gravity pulling you in faster and faster. But when you hit the second event horizon, it's like the eye of a storm: There is no singularity, and space-time seems to return to normal. At that point you hit anti-gravity after the second event horizon. So you would be spit right back out. But interestingly you will not come back to the same universe. You will end up in a parallel universe. With a brilliant idea and equations based on Einsteins relativity theories, Ronald Mallett from the University of Connecticut has devised an experiment to observe a time traveling neutron in a circulating light beam. While his team still needs funding for the project, Mallett calculates that the possibility of time travel using this method could be verified within a decade. WAS JOHN TITOR TELLING US ABOUT FUTURE TECH DISCOVERIES? Second, and more unusually, high ion temperatures were sustained after the plasma had stagnated  that is, after its ions had presumably lost motion and therefore energy and therefore heat  as though yet again some unknown agent was providing an additional energy source to the ions. RECORD SET FOR HOTTEST TEMPERATURES ON EARTH - Scientists produce gas more than 100 times hotter than the Sun. One thing that puzzles scientists is that the high temperature was achieved after the plasmas ions should have been losing energy and cooling. Also, when the high temperature was achieved, the Z machine was releasing more energy than was originally put in, something that usually occurs only in nuclear reactions. Sandia consultant Malcolm Haines theorizes that some unknown energy source is involved, which is providing the machine with an extra jolt of energy just as the plasma ions are beginning to slow down. IS THE ATTORNEY REPRESENTING JOHN TITOR'S FAMILY COMING FORWARD IN OUR TIME? 2/17/2006 - George Noory's taped interview with John Titor family attorney, Larry Haber and John's alleged mother, Kay. IS JOHN TITOR A FAKE? 1. John TItor was telling us about a possible future, perhaps a future that he experienced and tried to warn us about. He often said that once a future was known it could be changed. If this is true, could it be that we were headed for a civil war and we stopped it because of John? It's difficult to totally discount his claims as a time traveler due to the many number of things he was right about. What would be easier to stop, an event leading to a civil war (like maybe an election) or the steady progress of science toward the creation of a black hole at CERN? 2. In the posts, John alluded to the fact that he had done something to change our future in 1975. According to John, the year 2000 he experienced WAS affected by the Y2K computer problem. Did John stop Y2K for us, thus causing a series of events leading to the future we know now? IS A JOHN TITOR MOVIE IN THE WORKS? Many people believe that the final secret to the John Titor story rests with one person, Larry Haber, the attorney who claims to represent John's family in our time. In the last few weeks, Larry has announced that a movie is in the works about John. Check this site for a few still shots from the film. This site has a short forum where Larry is answering questions about the film and John. According to Larry, the actor playing John is named Michael Hartson. Other John Titor topics on the same site. Scientists at the Sandia National Labs in Albuquerque, New Mexico have accelerated a small plate from zero to 76,000 mph in less than a second. The speed of the thrust was a new record for Sandia's "Z Machine", not only the fastest gun in the West, but in the world too. The Z Machine is now able to propel small plates at 34 kilometers a second, faster than the 30 kilometers per second that Earth travels through space in its orbit about the Sun. That's 50 times faster than a rifle bullet, and three times the velocity needed to escape Earth's gravitational field. JOHN - As a result of the many conflicts, no, there were no sofficial Olympics after 2004. However, it appears they may be revived in 2040. PARIS: Foreign Minister Bernard Kouchner of France said Tuesday that the European Union should consider punishing China's crackdown in Tibet with a boycott of the opening ceremony of this summer's Olympic Games in Beijing. Public protests in a growing number of European and US cities are calling on their governments to denounce the Chinese Government for its crackdown in Tibet, with new reports that some athletes may be considering a boycott of the Olympics Games. IS THIS THE WIRELESS SYSTEM JOHN SAID WOULD DOMINATE INTERNET DELIVERY IN THE FUTURE? JOHN - Actually, you will probably be quite impressed with our Internet. It's based on a series of independent, self-powered nodes that are mobile and can be put up anywhere. It looks a great deal like your current cell phone system. Intel has developed a means of transmitting Wi-Fi over a distance of 60 miles, making it possible to bring the internet to people living in the sticks. The technology, dubbed the "Rural Connectivity Platform" (RCP) consists of a processor, radios, specialized software, and an antenna that can crank out data rates of about 6.5 megabits per second. ...Plus, the radios consume very little power, making it possible to run them on solar energy. Sign up now to listen to the Coast to Coast past shows and hear George Noory interview Dr. Ron Mallet on his theories of time travel and building a real time machine. Is it odd that Dr. Mallet's statements on the physics of time travel sound exactly like John's? Scientist claims a donut-shaped gravity field could open the door for time travel. Is this the same donut--shaped black hole John spoke about seven years ago? John was asked if there was any progress in fighting cancer in the future. He said modified virus cells would be used with success to fight cancer. It looks like he was right. ARE 13% OF ALZHEIMER'S PAIENTS ACTUALLY SUFFERING FROM MAD COW DISEASE? John warned us of how bad Mad Cow would be in the United States by 2036. Is the disease as bad as he says because it's being covered up now? "In our own neuropathological material, in 46 cases diagnosed clinically as AD [(Alzheimer's)], 6 cases were proven to be CJD at autopsy [13%}." This is the first report of the neuropathological changes associated with this particular abnormality of the PrP gene and it seems to demonstrate a transition between the pathology of prion disease and that of Alzheimer's disease. The importance of PrP gene analysis to the understanding of neurodegenerative diseases is stressed. The U.S. government's monitoring system for cases of Creutzfeldt-Jakob disease, a fatal human brain illness, could be missing tens of thousands of victims, scientists and consumer advocates have told United Press International. Creutzfeldt-Jakob disease or CJD can be caused by eating beef contaminated with mad cow disease, but the critics assert without a better tracking system it might be impossible to determine whether any CJD cases are due to mad cow or obtain an accurate picture of the prevalence of the disorder in the United States. Is this why John told us there would be great advances in the treatment of cancer? Techniques developed by atomic physicists are being used to develop the first of what promises to be a new generation of cancer treatments in place of conventional radiotherapy. One day doctors could even be using anti-matter. Recent announcements from the CERN laboratory in Geneva have aroused considerable interest in some medical circles. Cancer cells were successfully targeted with anti-matter subatomic particles, causing intense biological damage leading to cell death. These pilot experiments may have future potential. But applications borrowed from particle physics are already being used in cancer treatment to help avoid the major side effects of radiotherapy. In conventional radiotherapy, X-ray beams pass through the entire thickness of the body, so that many organs and tissues receive unnecessary radiation. 05/19/06 "Human Events" -- -- President Bush is pursuing a globalist agenda to create a North American Union, effectively erasing our borders with both Mexico and Canada. This was the hidden agenda behind the Bush administration's true open borders policy. Why doesn't President Bush just tell the truth? His secret agenda is to dissolve the United States of America into the North American Union. The administration has no intent to secure the border, or to enforce rigorously existing immigration laws. Securing our border with Mexico is evidently one of the jobs President Bush just won't do. If a fence is going to be built on our border with Mexico, evidently the Minuteman Project is going to have to build the fence themselves. Will President Bush protect America's sovereignty, or is this too a job the Minuteman Project will have to do for him? What's the North American Territory? It's the planned merger of Canada, the United States, and Mexico. It?s already been agreed upon, the ink has dried. The new NAFTA superhighway to connect all the poor of Mexico with the poor of America will be implemented starting next year. This road runs from the southern tip of Mexico, through the United States up to Canada. The center Mexican drop off will be Kansas City. 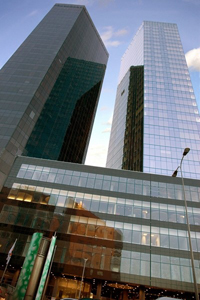 How will they get you used to this merger? In all your movies of course, just like how they got you used to interracial marriage. In the last episode of Dr. Who the other night, a young British girl was looking down on the earth from a spaceship of the future and she said, Oh, I can see the North American Territory from here! See? They make it fun! It's very easy. Q: Do most of the people of that time die, especially ones that currently have health problems? John: Yes, and people are still dying and a great deal of them are passing from CJD. As I said, with my very first few posts almost 6 months ago, I want to emphasize how devastating this will be. I believe two people are confirmed dead in Colorado from CDJ from surgical instruments. Ahhhh, the power of cheese. Milk does a body good and beef is what's for dinner! John: "No, I have not tried any fast food. Thinking about where the food came from, how it was shipped and treated absolutely terrifies me. I have tried to tell people about CJD disease and it seems to be "catching on" in Europe." John: Do not eat or use products from any animal that is fed and eats parts of its own dead. Posted Friday, June 23, 2006 by NewsTarget, Key concepts: mad cow, mad cow disease and brain tissue. A new study of members of New Guinea's Fore tribe suggest that more people may die from past mad cow disease outbreaks. The study shows that tribe members who contracted a similar disease to mad cow through cannibalism may have lived for decades before finally succumbing. This leads some scientists to question if additional mad cow deaths could show up long after intial reports of the disease were made. Researchers noted that some infected members of the tribe were able to live for years without any symptoms of kuru, and found that the disease can incubate for up to 56 years before causing a rapid descent into dementia and death. The study authors theorize that some people infected with mad cow disease may also be able to live long lives before succumbing to the disease. The infected cow, found near Gimli, Manitoba, was at least 15 years of age and was born before Canada implemented restrictions on potentially dangerous feed in 1997, said Dr. George Luterbach, a senior veterinarian with the Canadian Food Inspection Agency. Federal officials confirmed Canada's sixth case of mad cow disease since 2003 on Tuesday and promised a thorough investigation. Tests confirmed last week's initial suspicion that the cow near Gimli, Manitoba, was infected with Bovine Spongiform Encephalopathy, or BSE, the Canadian Food Inspection Agency said. The animal was at least 15 years of age and was born before Canada implemented restrictions on potentially dangerous feed in 1997, Dr. George Luterbach, a senior veterinarian with the agency, told reporters. Tracing the Animal to Its Source? An investigation will be launched to confirm where the cow was born and what other animals may have eaten the same feed. "One can then hopefully identify the birth cohort -- those are animals born within one year of the known positive animal and who may have consumed the same contaminated feed," he said. REVELATION 13: The English King James version Bible code - Part 14a - The Prophecies of John Titor, Time Traveler from the Future? WAS JOHN CHASTISING OR WARNING US ABOUT A GLOBAL REDUCTION IN POPULATION? JOHN - NOV 15, 2000: "Have you considered that your society might be better off if half of you were dead?" JOHN - NOV 21, 2000: "How can you possibly criticize me for any conflict that comes to you? I watch every day what you are doing as a society. While you sit by and watch your Constitution being torn away from you, you willfully eat poisoned food, buy manufactured products no one needs and turn an uncaring eye away from millions of people suffering and dying all around you. Is this the "Universal Law" you subscribe to? AUSTIN - University of Texas professor says the Earth would be better off with 90 percent of the human population dead. "Every one of you who gets to survive has to bury nine," Eric Pianka cautioned students and guests at St. Edward's University on Friday. Pianka's words are part of what he calls his "doomsday talk" - a 45-minute presentation outlining humanity's ecological misdeeds and Pianka's predictions about how nature, or perhaps humans themselves, will exterminate all but a fraction of civilization. 6.5 billion humans is too many. In his estimation, "We've grown fat, apathetic and miserable," all the while leaving the planet parched. The solution? A 90 percent reduction. That's 5.8 billion lives - lives he says are turning the planet into "fat, human biomass." He points to an 85 percent swell in the population during the last 25 years and insists civilization is on the brink of its downfall - likely at the hand of widespread disease. Pretty good conversation on our favorite time traveler. Online Comic Strip Includes John Titor. John Titor appears as a character in a comic strip entitled, "When I Grow Up." -John Titor: a Time Traveller From The Year 2036? "This season had three major themes permeating the thirty-three episodes: Tabatha's development, Aunt Clara, and time travel. Yes, time travel, albeit with fewer paradoxes than one might find in a John Titor web posting." OLIVER WILLIAMS ON "WORLD OF THE UNEXPLAINED"
Tonight - March 13, 2006; 8PM to 10PM EST, 5PM to 7PM PST. Call in and ask me anything you want. I'll be live on a net radio interview discussing John Titor. ANOTHER PREDICTION FROM JOHN - THE Z-MACHINE LEADS TO INTERDIMENSIONAL TRAVEL! 3/13/2001 - JOHN SAID: The "machine" with the energy to do it will come on-line very soon. The "method" for doing it has already been "mostly" perfected in the Z machine at the National lab in New Mexico. 3/2001 - JOHN SAID: (before I leave) ...we didn't even get a chance to talk about the Z-Machine. The US air force has expressed an interest in the idea and scientists working for the American Department of Energy - which has a device known as the Z Machine that could generate the kind of magnetic fields required to drive the engine - say they may carry out a test if the theory withstands further scrutiny. Kevin - sent us this! "Hi, I'm a big fan of the John Titor story and have been following the news relating to this sort of thing ever since I found the website. Anyway I found this article that looks interesting and might be relative to what John was talking about." Are you ready to make the jump to hyperspace? A controversial paper, outlining a "motor [that] would propel a craft through another dimension at enormous speeds" is making waves in military and scientific circles, New Scientist reports. "It could leave Earth at lunchtime and get to the moon in time for dinner. There's just one catch: the idea relies on an obscure and largely unrecognised kind of physics." The theoretical engine works by creating an intense magnetic field that, according to ideas first developed by the late scientist Burkhard Heim in the 1950s, would produce a gravitational field and result in thrust for a spacecraft." Also, if a large enough magnetic field was created, the craft would slip into a different dimension, where the speed of light is faster, allowing incredible speeds to be reached. Switching off the magnetic field would result in the engine reappearing in our current dimension. Professor Jochem Hauser, one of the scientists who put forward the idea, told The Scotsman that... "NASA have contacted me and next week I'm going to see someone from the [US] air force to talk about it further, but it is at a very early stage. I think the best-case scenario would be within the next five years [to build a test device] if the technology works." Sandia National Laboratories, in New Mexico, "runs an X-ray generator known as the Z machine" which might be able to test some of the basic science behind Hauser's theories, New Scientist observes. For now, though, [Sandia space scientist Roger] Lenard considers the theory too shaky to justify the use of the Z machine. "I would be very interested in getting Sandia interested if we could get a more perspicacious introduction to the mathematics behind the proposed experiment," he says. "Even if the results are negative, that, in my mind, is a successful experiment." HOST: While reading the other sites, posts, and email, this month appears to be the moment of truth for many who have followed the John Titor story. In describing his history, John told us of a civil war in the United States that would start some time in 2005 and manifest itself into a shooting war by 2008. He also stated that there were no Olympic games after 2004. Many believe that if these things do not come to pass then everything John said must be false. But John also told us that we have the power to change the future. In a multiple universe reality, knowing something will happen does make a difference. So is this end of the John TItor story or are we still missing a crucial piece of information that John was trying to tell us? You decide! I've been reading what John Titor had to say for five years now and it's all Bull@&#&!!!!!!! Where's the civil war? Can you tell me? If John was a time traveler, don't you think he would have gotten that little detail right?!!! See you at the Olympic games you #&%# HEAD! I have to admit, I've been watching the news with some anticipation. I'm not sure what I was waiting for, maybe the start of a civil war with an insurgence on main street or the outbreak of bird flu in Italy that would cancel the Olympic games. I decided the effort I put into the John Titor adventure was nothing more than a waste of time until I went back and read the posts again. Now, I may be more confused than ever. John said there would be a civil war in the United States by 2005. He also said the "shooting" would be common by 2008.? What does that mean?? Is John right and we just can't see it? Is the battle between left vs. right, right to life vs. right to choose, and stay in Iraq vs get out of Iraq the "start" of a civil war? Is the John Titor saga over? ... John said he have the ability to change the future with knowledge of events that will happen. That's why he wouldn't tell us about earthquakes and plane crashes. If you knew, you wouldn't go there or fly. He also said he was afraid he had changed things just by going to 1975 and showing up again in 2000. Could it be that the reason our time is not exactly like John's is because we changed it?? Examine the possibility! John also stated that Mad Cow disease would be in the U.S and effect the world for many years to come. Now that's something that would be very hard to change even if you knew about it a few years before it happened. Therefore, Mad Cow happens like John said. He also said that CERN would discover black holes in their new accelerator months before anyone was talking about it in the news. Can you stop a scientific discovery? I say no. That's why John was right about that too. So here's my theory. John said he was afraid he affected our time by changing the Y2K problem in 1975. Ever wonder why it didn't happen? If that's true, then maybe that's why the civil war isn't unfolding the way we expect it. Maybe our future will be WORSE than John's and that's what he was trying to tell us!!! Titor Reporter Simon sends this! If someone gets a chance, please check this information against John's statements in his verbal fist to cuffs with Darby at the Anomalies site. For anyone not familiar with John's statements about physics and time travel (made over three years ago when mini-black holes and alternate universes were the stuff of science fiction! ), read the posts on this and other sites left by John. Ever since physicists invented particle accelerators, nearly 80 years ago, they have used them for such exotic tasks as splitting atoms, transmuting elements, producing antimatter and creating particles not previously observed in nature. With luck, though, they could soon undertake a challenge that will make those achievements seem almost pedestrian. Accelerators may produce the most profoundly mysterious objects in the universe: black holes. When one thinks of black holes, one usually envisions massive monsters that can swallow spaceships, or even stars, whole. But the holes that might be produced at the highest-energy accelerators--perhaps as early as 2007, when the Large Hadron Collider (LHC) at CERN near Geneva starts up--are distant cousins of such astrophysical behemoths. They would be microscopic, comparable in size to elementary particles. They would not rip apart stars, reign over galaxies or pose a threat to our planet, but in some respects their properties should be even more dramatic. Because of quantum effects, they would evaporate shortly after they formed, lighting up the particle detectors like Christmas trees. In so doing, they could give clues about how space-time is woven together and whether it has unseen higher dimensions. Stellar collapse is not the only way that holes might form, however. In the early 1970s Stephen W. Hawking of the University of Cambridge and one of us (Carr) investigated a mechanism for generating holes in the early universe. These are termed "primordial" black holes. As space expands, the average density of matter decreases; therefore, the density was much higher in the past, in particular exceeding nuclear levels within the first microsecond of the big bang. The known laws of physics allow for a matter density up to the so-called Planck value of 1097 kilograms per cubic meter--the density at which the strength of gravity becomes so strong that quantum-mechanical fluctuations should break down the fabric of spacetime. Such a density would have been enough to create black holes a mere 1035 meter across (a dimension known as the Planck length) with a mass of 108 kilogram (the Planck mass). This is the lightest possible black hole according to conventional descriptions of gravity. It is much more massive but much smaller in size than an elementary particle. Progressively heavier primordial black holes could have formed as the cosmic density fell. Any lighter than 1012 kilograms would still be smaller than a proton, but beyond this mass the holes would be as large as more familiar physical objects. Those forming during the epoch when the cosmic density matched nuclear density would have a mass comparable to the sun's and so would be macroscopic. The production of black holes by particle accelerators is an even more exciting possibility. When it comes to producing high densities, no device outdoes accelerators such as the LHC and the Tevatron at the Fermi National Accelerator Laboratory near Chicago. 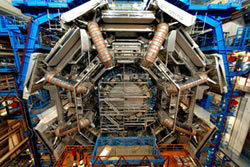 These machines accelerate subatomic particles, such as protons, to velocities exceedingly close to the speed of light. The particles then have enormous kinetic energies. At the LHC, a proton will reach an energy of roughly seven tera-electron volts (TeV). In accord with Einstein's famous relation E = mc2, this energy is equivalent to a mass of 1023 kilogram, or 7,000 times the proton's rest mass. When two such particles collide at close range, their energy is concentrated into a tiny region of space. So one might guess that, once in a while, the colliding particles will get close enough to form a black hole. Over the past decade, however, physicists have realized that the standard estimate of the necessary Planckian density could be too high. String theory, one of the leading contenders for a quantum theory of gravity, predicts that space has dimensions beyond the usual three. Gravity, unlike other forces, should propagate into these dimensions and, as a result, grow unexpectedly stronger at short distances. In three dimensions, the force of gravity quadruples as you halve the distance between two objects. But in nine dimensions, gravity would get 256 times as strong. This effect can be quite important if the extra dimensions of space are sufficiently large, and it has been widely investigated in the past few years [see "The Universe's Unseen Dimensions," by Nima Arkani-Hamed, Savas Dimopoulos and Georgi Dvali; Scientific American, August 2000]. There are also other configurations of extra dimensions, known as warped compactifications, that have the same gravity-magnifying effect and may be even more likely to occur if string theory is correct. This enhanced growth of the strength of gravity means that the true energy scale at which the laws of gravity and quantum mechanics clash--and black holes can be made--could be much lower than its traditional value. Although no experimental evidence yet supports this possibility, the idea sheds light on numerous theoretical conundrums. And if it is true, the density required to create black holes could lie within the range of the LHC. HOST INTERVIEW ON TALKSPORT & JOHN TITOR FILM? HOST: Welcome and hello to all fellow John Titor fans. It's been quite a while since we've had a chance to update the site. Our email has been jammed up but the news stories continue to pour in. On Saturday, December 11, 2005, I'll be holding a live radio interview with Talksport in the UK. Latest rumor has it that Larry Haber, the attorney who represents John's mother in our time, has something to do with a film being shot about John Titor. Check the Time Travel Portal Forum here for still shots from the film! Mad cow disease has arrived in the United States. The USDA confirmed in June that a cow born and raised in Texas had the deadly brain-wasting disease-- the second case found here. Yet incredibly, the Food and Drug Administration refuses to end the practices that will keep the disease from spreading. HOST: Is this the man who invents John's Time machine? Scientists trying to replicate conditions that existed in the first microsecond after the Big Bang have discovered that gold ions ramming each other at nearly the speed of light produce a surprisingly powerful but unexpectedly brief explosion. "We expected the particles to be released for a much longer time at these high energies," said University of Washington physicist John Cramer. "Instead, the time is so short that we can't measure it. The time has grown shorter with increased energy instead of longer." HOST: John described the physical distortion around his time machine as doughnut shaped. Prof Ori's mathematical calculations published in Physical Review Letters earlier this month, further elaborate on the curved space theory. He proposed space could be twisted to produce a local donut-shaped gravity field. According to Prof Ori this would produce a time machine where every period of time after its creation would exist somewhere in the vacuum inside the donut. ARTIFICIAL BLACKHOLES ARE NOW REALITY? ARE WE LOOKING AT EARLY VERSIONS OF WORMHOLES TO BEND SPACE AND TIME?? We are looking at experiments that will be remembered after twenty or thirty years as remarkable achievements of the human civilization breaking out from the physical universe to higher dimensions of parallel universes and exposing ourselves to higher order alien civilization thriving there. HOST: Is this the computer technology John described in his posts? IBM has created a chip that can slow down light, the latest advance in an industrywide effort to develop computers that will use only a fraction of the energy of today's machines. HOST: Are the Chinese getting ready for N day? The ships are designed to operate far out at sea, part of the People's Liberation Army's development of a "blue water" navy intended to assert Chinese claims to Taiwan and other territories and protect sea lanes transporting vital natural resources. If the Americans draw their missiles and position-guided ammunition on to the target zone on China's territory, I think we will have to respond with nuclear weapons, said General Zhu Chenghu. A JOHN TITOR DOCUMENTARY AND BALLET!!!! IS CHINA READY TO START WORLD WAR III? FEB 2001 - JOHN SAID: The West will become very unstable which gives China the confidence to "expand." I'm assuming you are all aware that China has millions of male soldiers right now that they know will never be able to find wives. I guess you could say that Taiwan, Japan, and Korea were all "forcefully annexed" before N Day. BEIJING (Reuters) - Thousands of Chinese smashed windows and threw rocks at the Japanese embassy and ambassador's residence in Beijing on Saturday in a protest against Japan's wartime past and its bid for a U.N. Security Council seat. Protesters pushed their way through a paramilitary police cordon to the gates of the Japanese ambassador's residence, throwing stones and water bottles and shouting "Japanese pig come out." Some 500 paramilitary police holding plastic shields raced into the compound and barricaded the gates. Protesters threw stones and bricks at the residence, and shouted at police, "Chinese people shouldn't protect Japanese." ASHINGTON, April 8 - After two senior-level meetings between North Korean and Chinese leaders over the last two weeks to discuss the North's nuclear-weapons program, the Chinese have failed so far to persuade North Korea to rejoin nuclear disarmament talks, senior administration officials and diplomats said Friday. As a result of the continuing deadlock, informal discussions have begun among the five parties to the talks on new, more aggressive strategies that could be used if and when it is decided that the talks have reached a dead end. ZHANJIANG, China When the flagship of the U.S. Navy's 7th Fleet came into view on a recent Monday afternoon, a Chinese naval band onshore quickly began playing as two rows of Chinese sailors snapped into formation and workers hurriedly finished tacking down a red carpet. The command ship, the Blue Ridge, answered with music from its own band and raised a Chinese flag below Old Glory. But the most apt symbolism in the stagecraft of the ceremonial visit came when the two navies staged a tug-of-war - evoking their emerging competition in East Asia. While the American military is consumed with wars in Iraq and Afghanistan, global terrorism, and the threat of nuclear proliferation in North Korea and Iran, China is presenting a new and strategically different security concern to America in the western Pacific, as well as to Japan and Taiwan, Pentagon and military officials say. China, these officials say, has smartly analyzed the strengths and weaknesses of the American military and focused its growing defense spending on weapons systems that could exploit the perceived weaknesses in case the United States ever needs to respond to fighting in Taiwan. John stated that mini black holes or microsingularities powered his time machine. He also stated that they would be discovered and developed in our lifetime. Is this the beginning of the technology John spoke about that leads to time travel? PROFESSOR OF PHYSICS JOHN G. CRAMER BACKS UP JOHN'S TECHNOLOGY? The following article was written by John G. Cramer, a physics professor at the University of Washington. The article is a combination of ideas and Q&A about the creation and manipulation of mini black holes in the laboratory. I've also included a few of the relevant statements John made about the very same subjects back in 2000 - 2001, nearly two years before the article was written. Could this be why John posted online? Was he trying to help us develop time travel or the use of mini black holes as an energy source? For more information on John G. Cramer, click here. The Large Hadronic Collider (LHC), which is to be the world's highest energy particle accelerator, is currently being constructed at the CERN laboratory in Geneva, Switzerland. The machine was designed to be high enough in energy to produce a completely new type of particle, the Higgs boson, which is considered to be the missing puzzle-piece in the Standard Model of particle interactions. According to current theoretical thinking , it is the Higgs particle that gives mass to all the other particles, quarks, leptons, etc., in the current bestiary of fundamental particles. However, there are new theoretical predictions that when the new accelerator goes into operation, the LHC's proton-proton collisions may also make something even more exotic: black holes. JOHN - FEB 2, 2001: Soon, CERN will bring their big machine on line and they will be smashing very fast and high-energy particles together. One of the more odd and potentially dangerous items produced from this increase in energy will be microsingularities a fraction of the size of an electron. Q: Are there ideas beyond the Standard Model that would allow production of a minimum-size black hole by an accelerator? A: Yes. New ideas suggest that gravity becomes stronger at small distances because of the effects of extra dimensions used only by gravity. In this scenario, as the effective value of G grows larger, the Planck mass drops, and the energy required to produce black holes can drop to 1 TeV, well within range of the LHC but probably out of reach for the Tevatron. Thus, the LHC may turn out to be a "black hole factory", an accelerator that makes large quantities of minimum-size black holes. 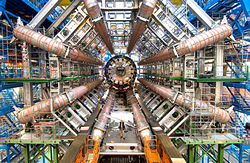 JOHN - DEC 30, 2000: I have never claimed to be a physicist or an expert on what the CERN laboratory is doing at any given moment so I feel it is pointless to argue about what they may be doing in the future or what "breakthroughs" they will or might have. My comments about the CERN lab are in reference to particle accelerators in general and other questions that have come up in the past. The major physics break through for controlled gravity distortion does happen at CERN in your future. Q: If such mini black holes were produced, what would be seen by the LHC detectors? A: First, if no black holes were produced, an LHC collision would make a relatively small number of high energy particles that form into back-to-back "jets" or groups of high energy particles going in the same direction. On the other hand, if a black hole was made, the particle count would increase dramatically but the energy of each particle would be much smaller. Instead of making perhaps 100 particles with kinetic energies around 100 GeV or more, a collision event that made a black hole would make thousands of lower energy particles, including many electrons, positrons, and photons with energies around 10 GeV or less. Such a dramatic in the character of an LHC proton-proton collision should be very obvious in the collision data, and should provide a "smoking gun" signal of the production of black holes. JOHN - NOV 25, 2000: The energy stored in the singularity is used to create the distortion fields. That energy is created in a particle accelerator. JOHN - MAR 13, 2001: However, and as I'm sure you are aware, Stephen Hawking admits that his own equations support the "possibility" that microsingularities may not totally disappear as they evaporate in a sea of virtual particles and in fact may leave behind a very stable naked singularity. I'm sure you can look that up. I suppose the difficult part is believing that we've taken advantage of it, not that it's impossible. 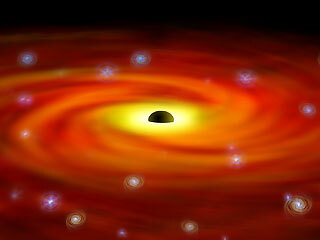 Q: Could such collision-produced mini black holes be "nurtured", prevented from decaying, and made larger? A: Perhaps, but it's not obvious how that could be done. The black hole evaporation could only be suppressed by surrounding it with a medium that was even hotter than it was, so that it absorbed more radiation than it emitted. No such medium could be sustained. Even the interior of the Sun would be a billion times too cool to do the job. However, if you could immerse the black hole in such a medium, it would grow in mass and radius and cool in temperature as it absorbed mass-energy from the medium. Eventually, it might be cooled enough that it could be removed from the hot environment and become relatively stable. JOHN - NOV 6, 2000: The mass and gravitational field of a microsingularity can then be manipulated by "injecting" electrons onto its surface. By rotating two electric microsigularities at high speed, it is possible to create and modify a local gravity sinusoid that replicates the effects of a Kerr black hole. Q: Would a stable black hole have any uses? A: Indeed it would. It would be an excellent mass-detector and a wonderful energy source. It could be fed mass, and some fraction of the mass-energy (E=mc2) could be recovered and used. However, as a number of SF writers have pointed out, a "tame" black hole would also represent a certain hazard, since if it were accidentally dropped, if would probably fall to the center of the Earth and devour the planet from the inside. JOHN - NOV 7, 2000: There is thought that a singularity generator could also be used but most people are against it. JOHN - JAN 1, 2001: The source of power for the C204 that allows it to distort and manipulate gravity comes from two microsingularities that were created, captured and cleaned at a much larger and "circular" facility. The dual event horizons of each one and their mass is manipulated by injecting electrons onto the surface of their respective ergospheres. The electricity comes from batteries. The breakthrough that will allow for this technology will occur within a year or so when CERN brings their larger facility online. JOHN - JAN 29, 2001: I realize my claims are a bit ridiculous but my intent is not really to be believed. However, if I had an opportunity to talk to a time traveler, I might ask questions like: How exactly does the singularity sensor measure the expansion of the inner event horizon or why does the reality of multiple worlds support the religious dogma that there are no good or bad people just good and bad decisions or what were the political motivations that changed the U.S. Constitution? Are there any problems with this theoretical scenario? I'm afraid so. The problems revolve around issues of time-reversal invariance and the arrow-of-time problem. In the everyday world we have no difficulty in distinguishing one direction of time from the other. A movie showing a dropped egg hitting the floor or a car crash looks very strange and unphysical if the film is run backwards. But on the macroscopic scale, there is supposed to be no time preference. A movie of the interaction of fundamental particles is expected to represent expected behavior, even if the movie is running backwards. This is called "time-reversal invariance" and it is an important symmetry principle of the microscopic world. But a mini black hole would strongly violate this symmetry. A movie of a super-hot black hole emitting particles has a distinct time direction and would look strange and unexpected if the movie were run backwards. This means that particle collisions at the LHC should show dramatic violations of time reversal invariance. Moreover, since right-vs.-left handedness and matter-vs.-antimatter asymmetries cannot be expected to compensate, the more fundamental TPC symmetry principle (time-reversal plus matter-antimatter interchange plus reversal of spatial directions) will also be violated. 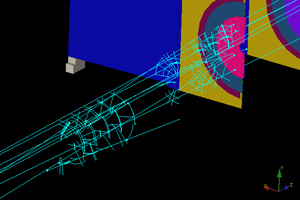 Even at lower collision energies at accelerators like the FermiLab Tevatron, where there may not be enough collision energy to produce free black holes, sub-threshold virtual process involving black holes might be expected to produce time reversal and TCP symmetry violations, (but we note that none have been observed). Is there any way around this problem that would permit mini black hole production at the LHC? The physics literature is silent on this issue because the time-reversal invariance aspects of black hole production in particle collisions have not yet been analyzed or discussed in detail. However, the time-reversal problem of the above scenario could be cured if the LHC produced black holes and white holes in pairs, with most of the particles emerging from the white hole feeding into the black hole. I'm not sure how such a system would evolve, but as in the black hole scenario above, it would probably evaporate into lighter particles and be observed primarily as a change in the character of the spectrum of particles emerging from an LHC collision. JOHN - JAN 15, 2001: Actually, there are 2 singularities in the unit. The gravity field is manipulated by three factors that affect it in distinct ways. Adding electric charge to the singularities increases the diameter of the inner event horizons. Adding mass to the singularities increases the area of gravitational influence around the singularities. Rotating and positioning the polar axis of the singularities affects and alters the gravity sinusoid. The effects of the gravity produced by the unit do not have enough time to significantly alter physical objects within a reasonable distance from the outside of the sinusoid. No, things do not get smaller. JOHN - FEB 14, 2001: By using two microsingularities in close proximity to each other, it is possible to create, manipulate and alter the Kerr fields to create a Tipler gravity sinusoid. This field can be adjusted, rotated and moved in order to simulate the movement of mass through a donut-shaped singularity and into an alternate worldline. Thus, safe time travel. The test of these ideas will come in a few years.. When the LHC goes into operation, we may discover the Higgs boson or we may find that indeed gravity becomes a strong force. Or we may discover other things that on one has even predicted.
" When they use the word "enemy", they're talking about YOU! You don't really think the Marines are going to jump out of helicopters overseas with sticky goop, pepper spray and seizure lights, do you? COLUMBUS, Georgia (AP) -- A man who telephoned a hot line to say he had a gun and was dreaming of killing children died after police shot him with supposedly non-lethal bean bag projectiles, officials said. Lester Zachary died Wednesday at a hospital, two days after he was shot at his home with two bean bag bullets. Zachary, 45, died of internal bleeding caused by a bullet hitting his spleen area, Muscogee County Coroner James Dunnavant said Thursday. A bean bag bullet is intended by police as a non-lethal alternative to shooting someone with a gun, Police Chief Ricky Boren said. But on July 17 afternoon, something went wrong. The ranger fired a "cracker shell" round that apparently ricochet off the ground and hit the bear. The animal ran across Slough Creek for about 200 yards and then lay down. The ranger watched the animal for about an hour before having to leave to respond to another crisis in the park. When rangers returned to the scene the next morning, the bear was dead from the injury. Apr 21, 2005  AMSTERDAM (Reuters) - The Netherlands has discovered its first case of Creutzfeld-Jakobs, the human form of "mad cow disease," the government said on Wednesday. The interior ministry said in a statement a patient at a hospital in the central town of Utrecht had been diagnosed with the disease and said it had informed European authorities. 20/04/2005 - Japanese food safety authorities have ordered further testing, after two cows were diagnosed with Bovine Spongiform Encephalopathy (BSE) during preliminary screening, Tom Armitage reports. The animals, which first tested positive earlier this month, were from Miyagi prefecture in northeast Japan and will mark Japans 18th and 19th cases of BSE, if final tests are confirmed in a few days time. According to reports in the Japanese press, tissue samples of the animals  a ten year old Holstein and an eighteen year old Japanese Black - have been sent to the National Institute of Infectious Disease in Tokyo for further screening. In February earlier this year, Japanese health officials diagnosed the first human to have contracted variant Creutzfeld Jacobs Disease (CJD)  the human form of the fatal, brain wasting disease. Beef from infected cattle entering the food chain is believed to have caused the fatal human condition, variant CJD. PARIS - France will step up testing goats for possible mad cow infection after an animal health agency found that more such cases may be uncovered, but no date has been set so far, the farm ministry said on Tuesday. The first case of a disease close to bovine spongiform encephalopathy (BSE), that ravaged European cattle herds and killed at least 100 people, was found in a French goat in January, prompting fears of a new crisis in the meat sector. After being asked to evaluate the risks of the disease spreading, the animal health agency AFSSA said only a limited number of cases was likely to be uncovered. However, it said non-systematic testing and the removal at slaughterhouses of materials at risk of being contaminated were insufficient to fully protect consumers. A veterinary scientist and former inspector for the US Department of Agriculture says the United States is intentionally under-reporting madcow disease. Lester Friedlander, now a consumer advocate, lost his job in the Philadelphia meat industry 10 years ago after alleging unsafe practices. He claims private laboratories confirmed that some suspect cow brains were infected with mad cow disease but they were cleared when retested by government labs. Dr Friedlander thinks there has been a cover-up. "I believe there is at the highest levels because of the political and economic impact," he said. "If we found mad cow disease we'd have to depopulate a lot of animals. With mad cow disease in the United States, it's an accident waiting to happen, that somewhere along the way we're going to find some positives and there'll be cattle from the United States, and not Britain or Canada." "Brain Trust" by Colm A. Kelleher Ph.D.
FAIZABAD: Nearly 65% of the animal livestock in north-eastern Badakshan province have died after contracting a form of mad-cow disease from cattle exported from Pakistan, said the head of the agriculture and livestock department, Eng. Mohammad Hassan. The disease has affected mainly animals in the districts of Shahr-e-Bozurg, Khiwa, Arghanshas and Wardaj. "This disease which was first discovered in Badakhshan two years ago, has been transmitted from commercial animals from Pakistan and other provinces." "We have many problems with agriculture and farming, and there is only one veterinary surgeon in Faizabad city with nobody in the districts," he said. He warned if the disease was not controlled it could spread throughout Faizabad. Jafar, a resident of Shahr-e-Bozurg talked to Pajhwok at the agriculture department. "I have 800 sheep out of which 750 are healthy so far, but 50 have died due to the epidemic," he said. He said there is no veterinary surgeon in his region to treat the animals. When John was posting, he made a few references to the Segway. He stated it wasn't going to amount to much. JAN 2001 - JOHN SAID: I was genuinely interested in your opinion of how "IT" was being presented and advertised. Do you feel manipulated? Do you think it's really a big deal? Do you like the way the news is dealing with it? LAB FIREBALL "MAY BE BLACK HOLE"
Horatiu Nastase says his calculations show that the core of the fireball has a striking similarity to a black hole. His work has been published on the pre-print website arxiv.org and is reported in New Scientist magazine. When the gold nuclei smash into each other they are broken down into particles called quarks and glutons. These form a ball of plasma about 300 times hotter than the surface of the Sun. This fireball, which lasts just 10 million, billion, billionths of a second, can be detected because it absorbs jets of particles produced by the beam collisions. But Nastase, of Brown University in Providence, Rhode Island, says there is something unusual about it. Ten times as many jets were being absorbed by the fireball as were predicted by calculations. The Brown researcher thinks the particles are disappearing into the fireball's core and reappearing as thermal radiation, just as matter is thought to fall into a black hole and come out as "Hawking" radiation. However, even if the ball of plasma is a black hole, it is not thought to pose a threat. At these energies and distances, gravity is not the dominant force in a black hole. Brown researcher thinks the particles are disappearing into the fireball's core and reappearing as thermal radiation, just as matter is thought to fall into a black hole and come out as "Hawking" radiation. However, even if the ball of plasma is a black hole, it is not thought to pose a threat. At these energies and distances, gravity is not the dominant force in a black hole. Now accepting pertinent news articles from Titor Reporters. Headlines and featured stories may be reviewed in the archives.